© 2002, © 2018 by Paul Freeman. Revised 11/2/18. 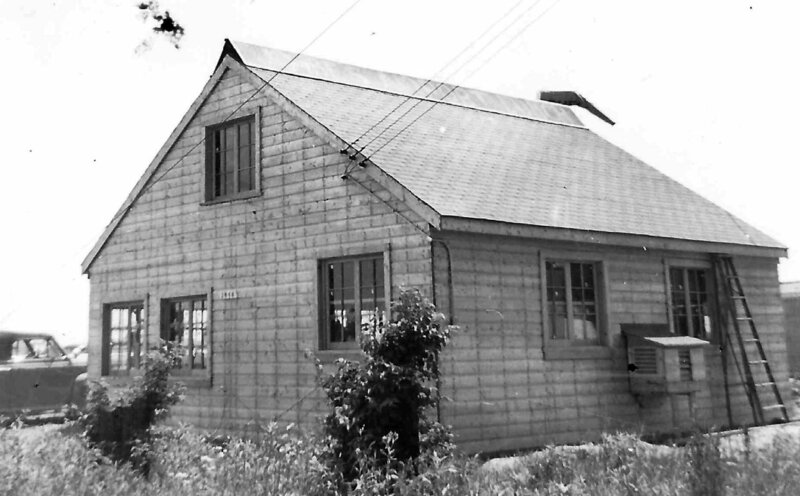 A June 1946 photo by Winfield Sluyter of a building at Warren Airport, presumably the airport office (courtesy of Rachel Fields). 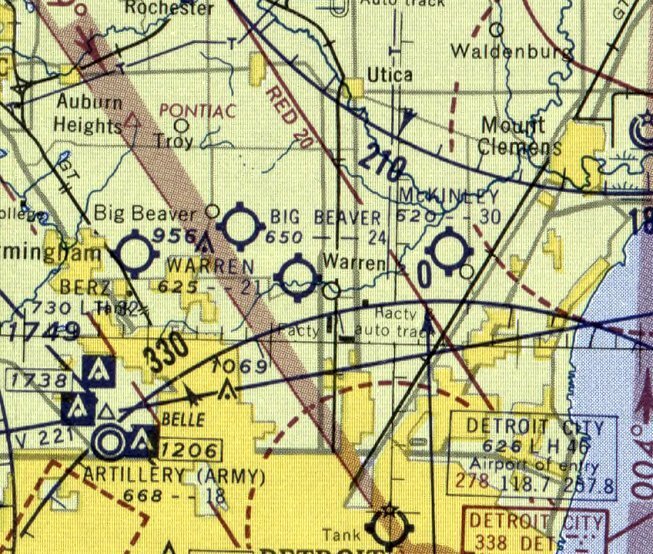 Warren Airport was not yet depicted on the May 1945 Detroit Sectional Chart. “The Warren Airport, or Detroit-Warren Airport sometimes referred to as the Kinnally Airport, was probably established in or before 1945. It started out as a private airport & had 3 hangars & 2 landing strips. One runway was 1,850', the other 1,800'. In 1946 the manager was John Kinnally. The earliest depiction which has been located of Warren Airport was a June 1946 photo by Winfield Sluyter of a building, presumably the airport office (courtesy of Rachel Fields). which depicted Warren as a commercial/municipal airport. depicted Warren Airport as having 2 unpaved runways, measuring 1,850' north/south & 1,800' east/west. Four buildings were depicted on the northwest corner, including a school & a restaurant. 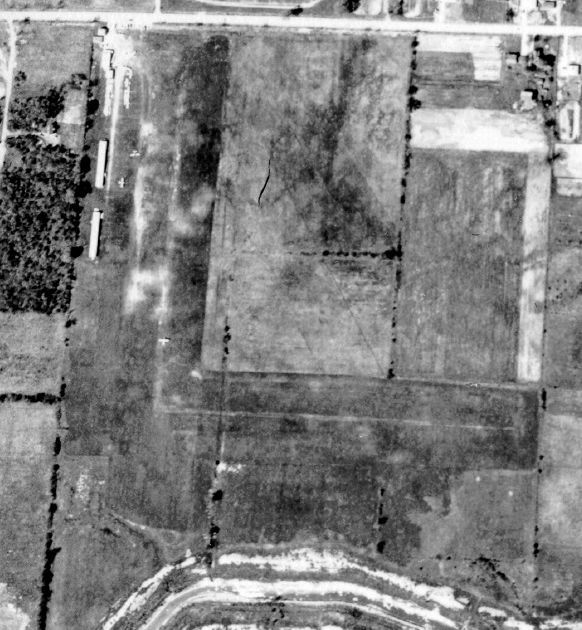 The earliest aerial photo which has been located of Warren Airport was a 1949 aerial view. It depicted Warren as having 2 perpendicular grass runways, with 3 long hangars & 5 single-engine aircraft on the northwest corner. The 1949 Detroit Sectional Chart (courtesy of Donald Felton) depicted Warren as having a 2,800' unpaved runway. 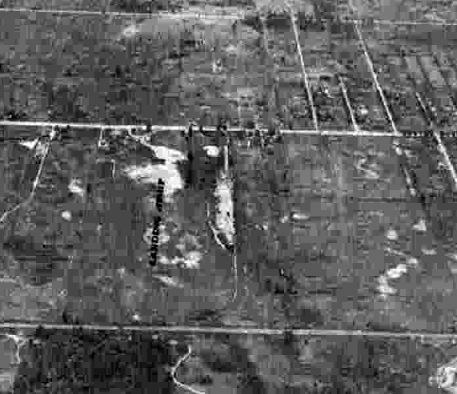 A 1952 aerial view of Warren Airport showed little change compared to the 1949 photo (according to Mike Denja). with the Intention of building a factory on the site & having the advantage of housing his own planes at the airport so that he could better utilize his airplanes in his business. However the Detroit Aviation Commission with the approval of Mayor Cobo, contacted Mr. Evans to ascertain whether he would be willing to sell Warren Airport to the City. but that he realized the urgent need for expanding the facilities of Detroit City Airport. Ted Larkins recalled, “Warren Airport was on the south side of 14 Mile [Road] & backed up to Red Run Drain, a bit west of Ryan. The Experimental Aircraft Association Chapter #13 originally met at the Warren Airport before they were even incorporated as a Chapter (1955) with 13 members. The founding president was Roger Perreault. They also apparently moved when the developers took over. Also located at the Warren Airport circa 1955 was the Warren Aviation Company who made wheel pants for Piper planes that were approved by the CAA. 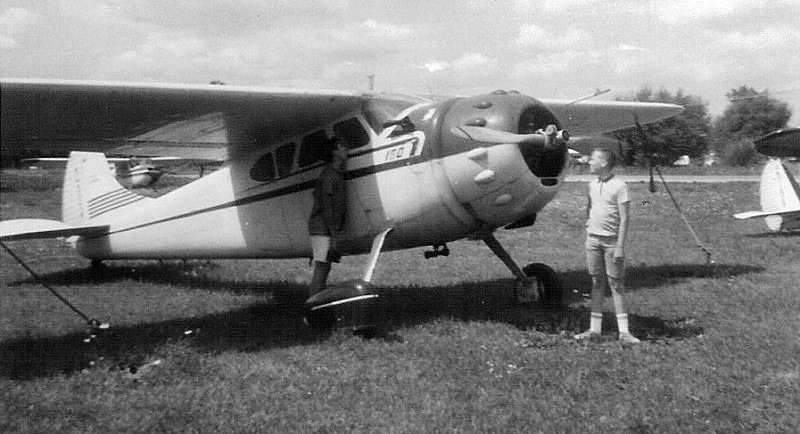 The Warren Flying Club was founded in 1957 at the Warren Airport. The 5 original members pooled their money & purchased a used 2-place Luscombe. 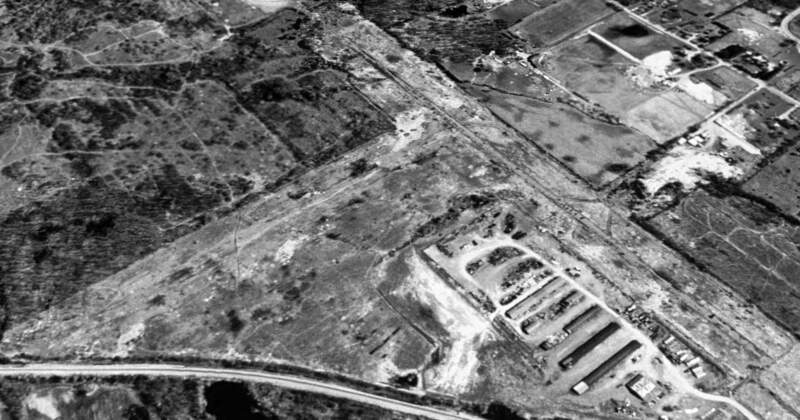 The last photo which has been located of Warren Airport was a 1957 aerial view (courtesy of Mike Denja). It depicted Warren as having 2 perpendicular grass runways, with 3 long hangars & 5 single-engine aircraft (including 1 on the north/south runway). The last aeronautical chart depiction which has been located of Warren Airport was on the May 1958 Detroit Sectional Chart. It depicted Warren as having a 2,100' unpaved runway. In 1958 The Michiganian reported: "The Detroit Aviation Commission has recommended that the Detroit-Warren Airport be closed to all traffic effective 9/1/58. 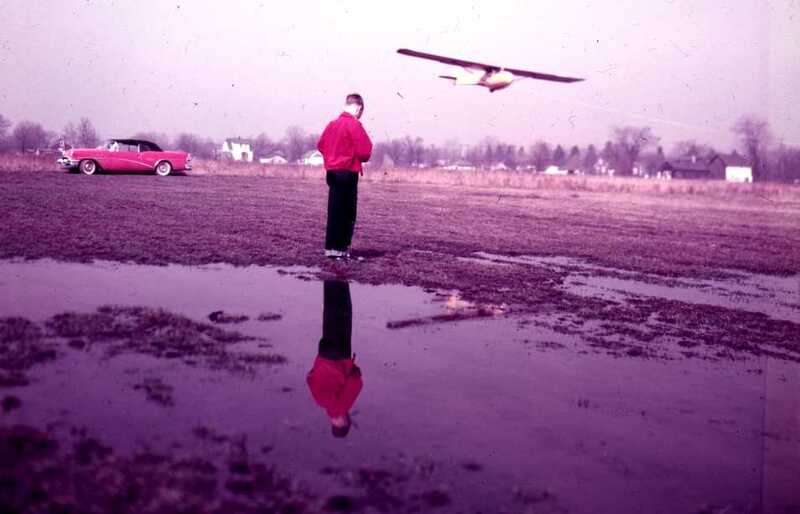 Warren Airport was lastly used by the Radio Control Club of Detroit in 1959 to fly radio controlled model planes. 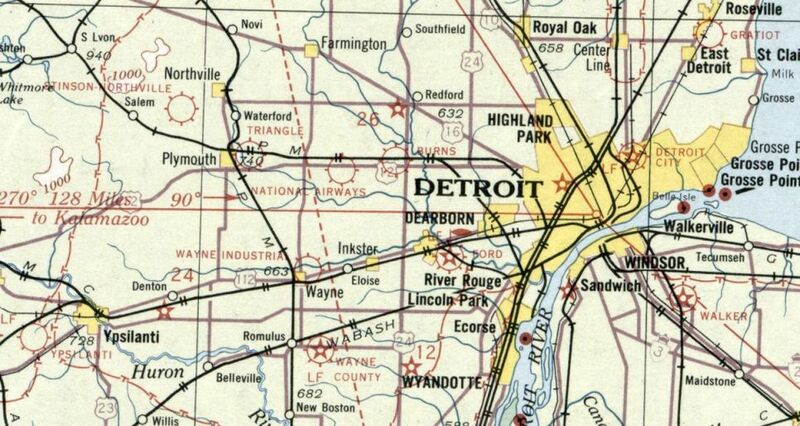 Warren Airport was no longer depicted on the January 1959 Detroit Sectional Chart. 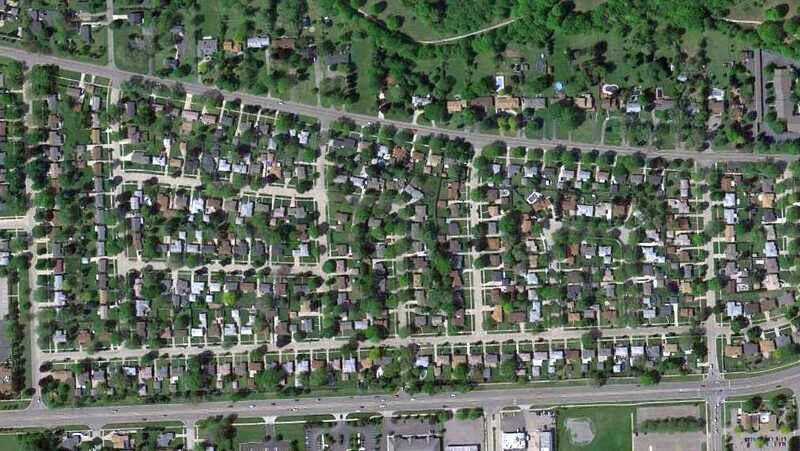 A 1961 aerial photo (according to Mike Denja) showed streets & homes being built on the site of Warren Airport. 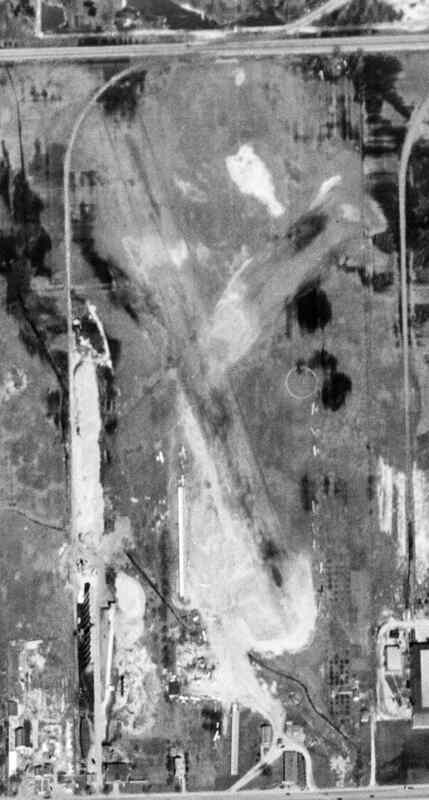 A 1999 aerial photo showed no recognizable trace remaining of Warren Airport. 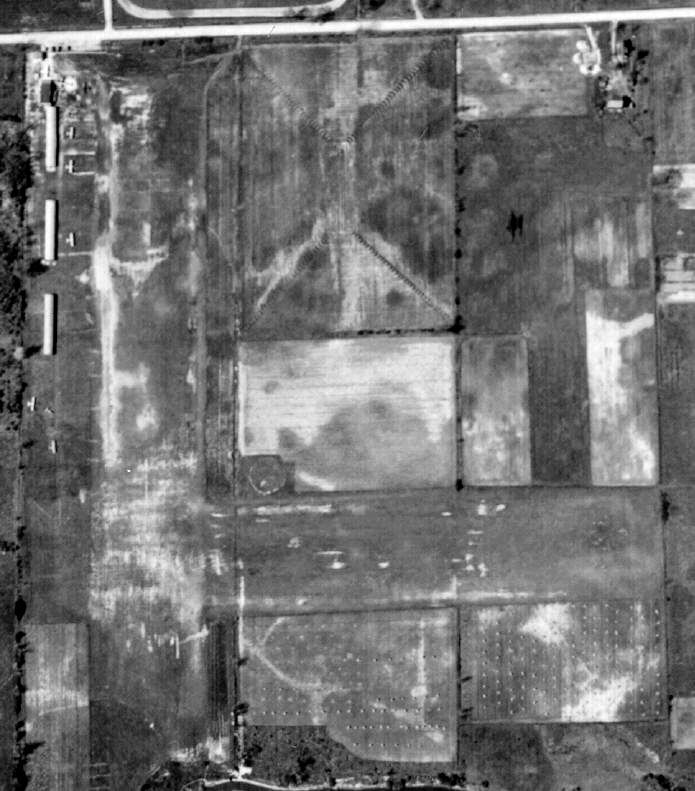 A 2015 aerial photo showed no recognizable trace remaining of Warren Airport. The site of Warren Airport is located at the intersection of Ryan Road & East 14 Mile Road. Thanks to Michael Bond for pointing out this airfield. 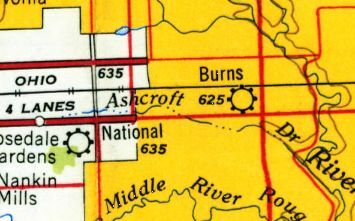 Burns Airport, as depicted on the June 1931 Detroit Sectional Chart. The date of establishment of this small general aviation airport has not been determined. which described an injury of an aircraft passenger at the airport. 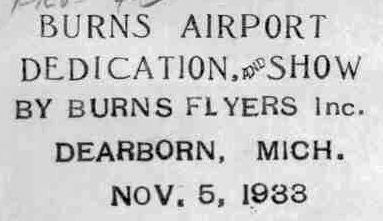 The earliest depiction which has been located of Burns Airport was on the June 1931 Detroit Sectional Chart. an occasion also accompanied by a show by the Burns Flyers Inc. 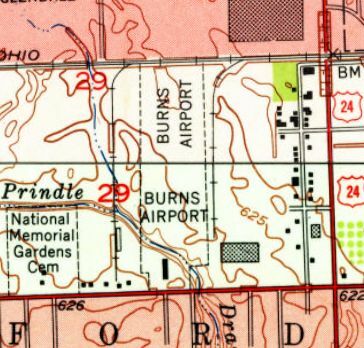 The 1936 USGS topo map depicted “Burns Landing Field” / “Burns Airport” as a north/south oriented property with a few small buildings on the south end. It depicted Burns Airport as having a single unpaved north/south runway. as a 40 acre rectangular property having a single 1,850' north/south clay, loam, and sod runway. and to be owned & operated by private interests. 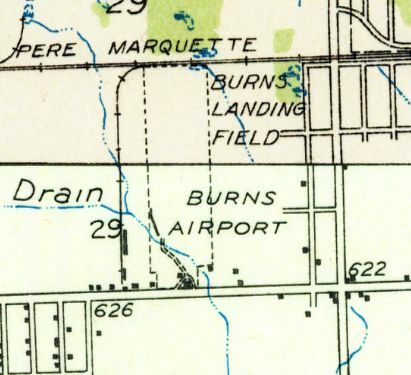 The location of Burns Airport, as depicted in the 1946 Michigan Airport Directory (courtesy of Doug Ranz). as having a 2,200' north/south runway & a very short 1,200' crosswind runway. An office, several shops & hangars were located on the south side. with over a dozen single-engine planes parked around some small buildings on the south side. 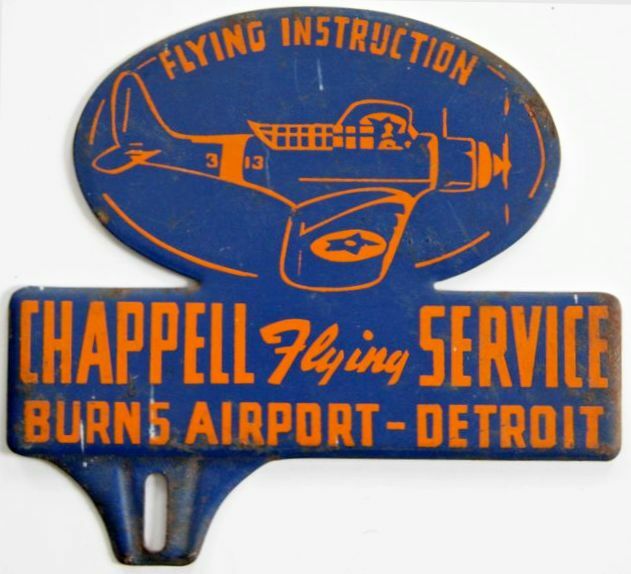 A circa late 1940s license plate frame advertising Burns Airport's Chappel Flying Service. 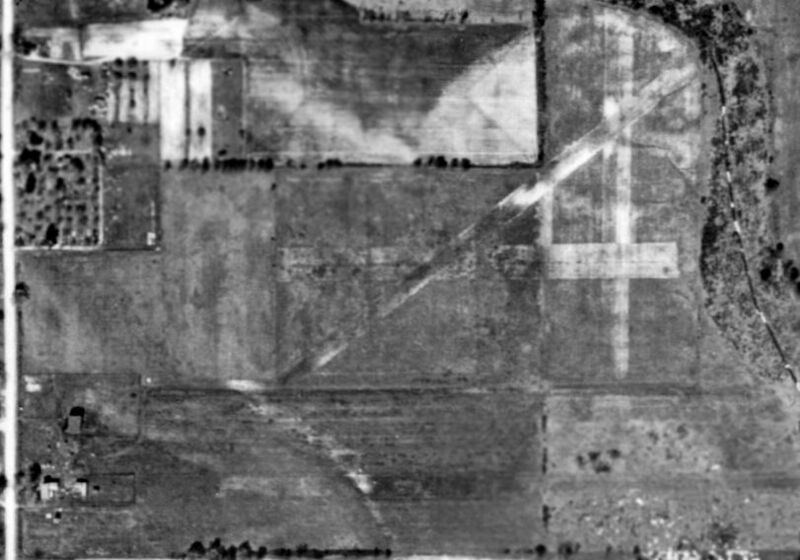 The last photo which has been located of Burns Airport was a 5/20/51 USGS aerial view. It depicted Burns Airport as having 2 unpaved runways, with over a dozen single-engine planes parked around some small buildings on the south side. The 1952 USGS topo map depicted Burns Airport as a north/south oriented property with 1 small building on the south end. 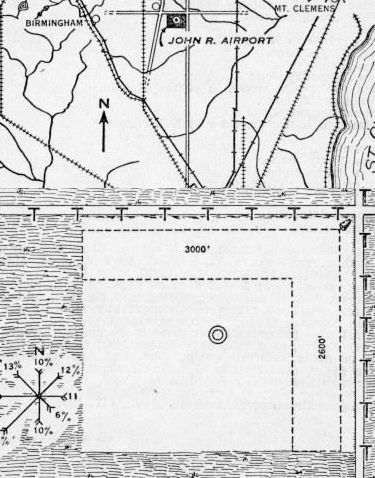 The last depiction which has been located of Burns Airport was on the 1954 USGS topo map. 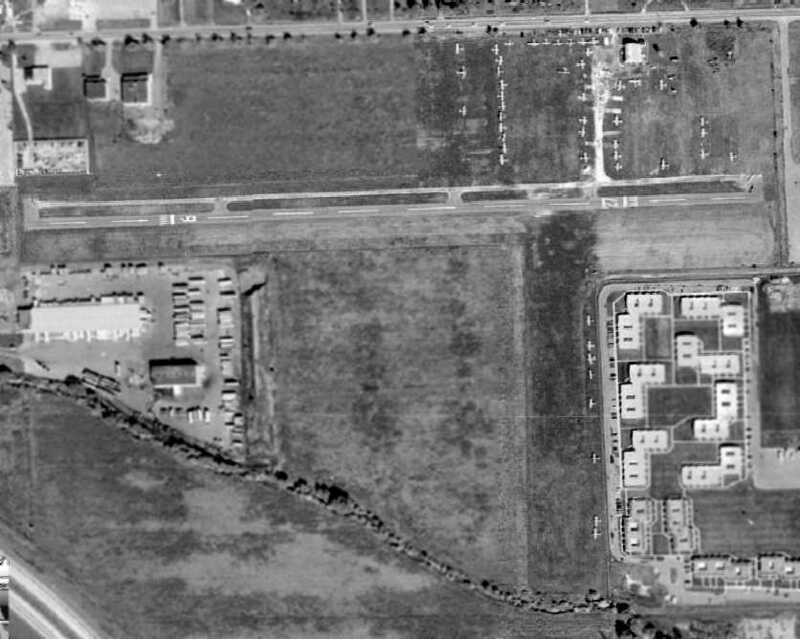 as a 1973 aerial photo showed that Dixie Drive had been built along the runway orientation, and commercial buildings had covered the site. 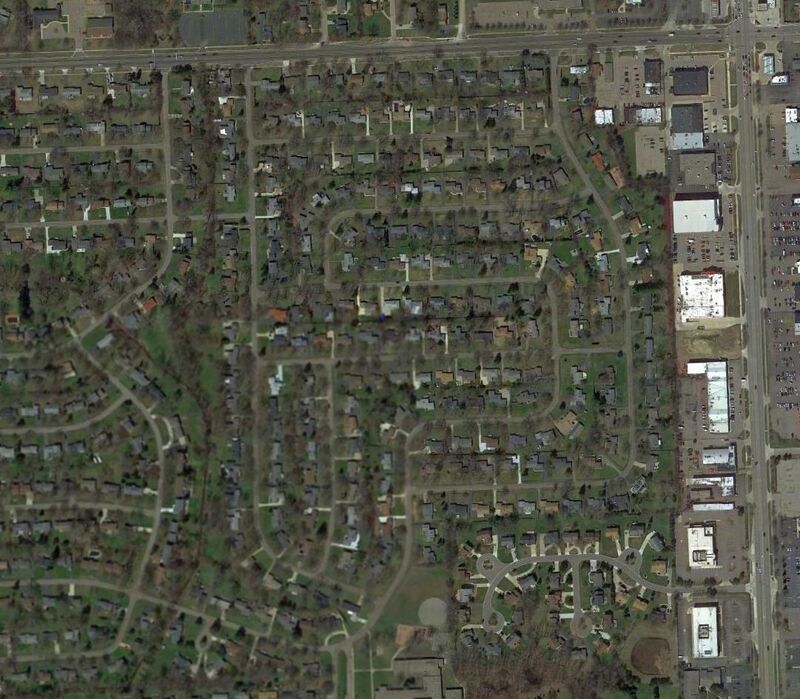 it evidently fell victim to being located in a area that became densely developed. 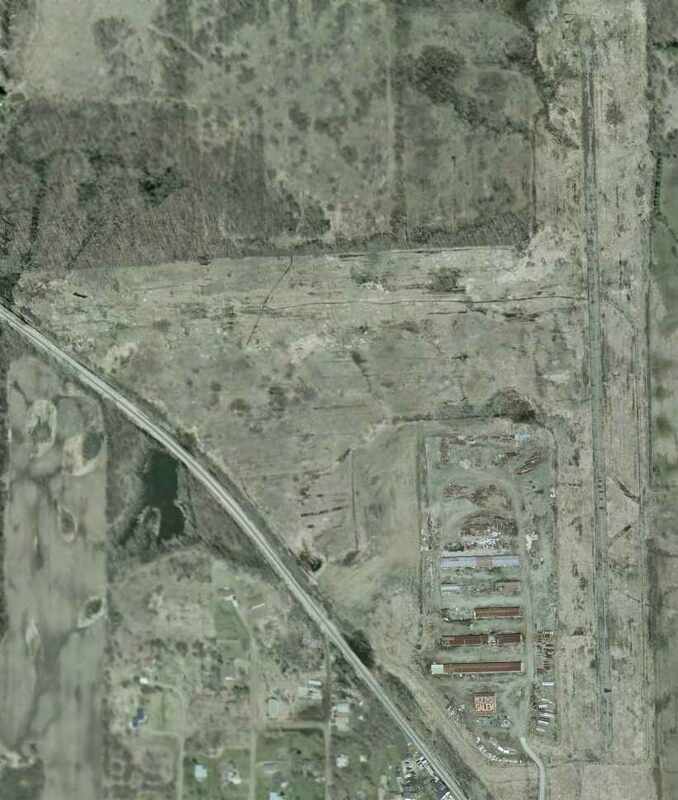 A 2010 aerial view showed no trace remaining of Burns Airport. 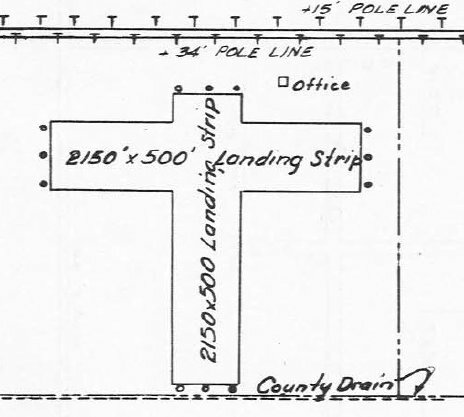 The site of Burns Airport is located north of the intersection of Dixie Road & Plymouth Road. 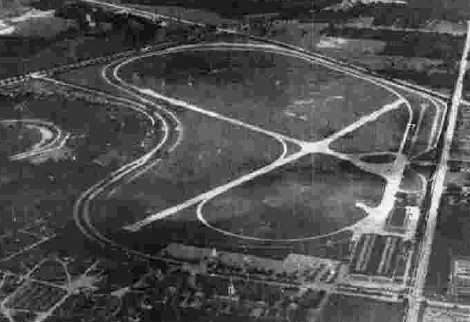 A 1949 aerial view of the Farmington Hills Airfield (courtesy of Mike Denja). Not much is known about this small airfield, including its name or date of construction. Detroit Sectional Charts from 1946-51, or on the 1947 Farmington Plat Map (courtesy of Mike Denja). 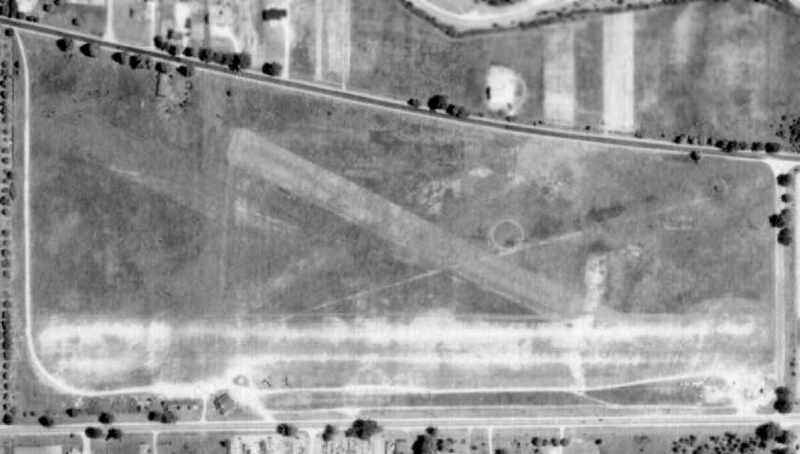 which depicted an airfield with 3 grass runways. This airfield was not depicted on the May 1954 Detroit Sectional Chart (courtesy of Mike Keefe) nor on the 1954 USGS topo map. 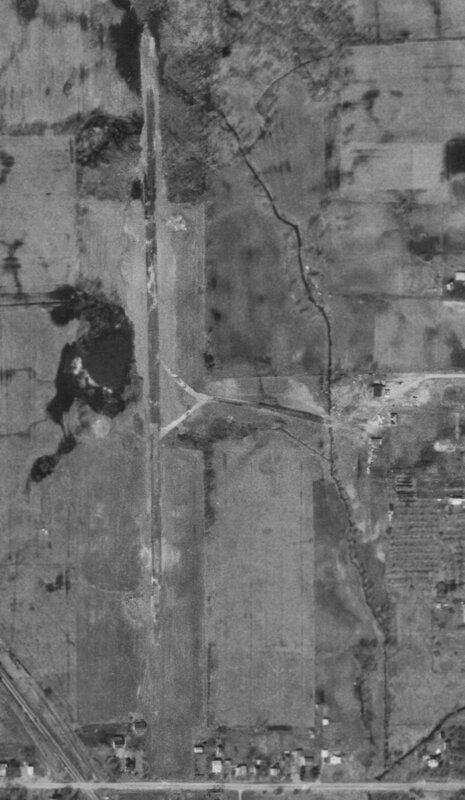 The last photo which has been located of the Farmington Hills Airfield was a 1956 aerial view (courtesy of Mike Denja). 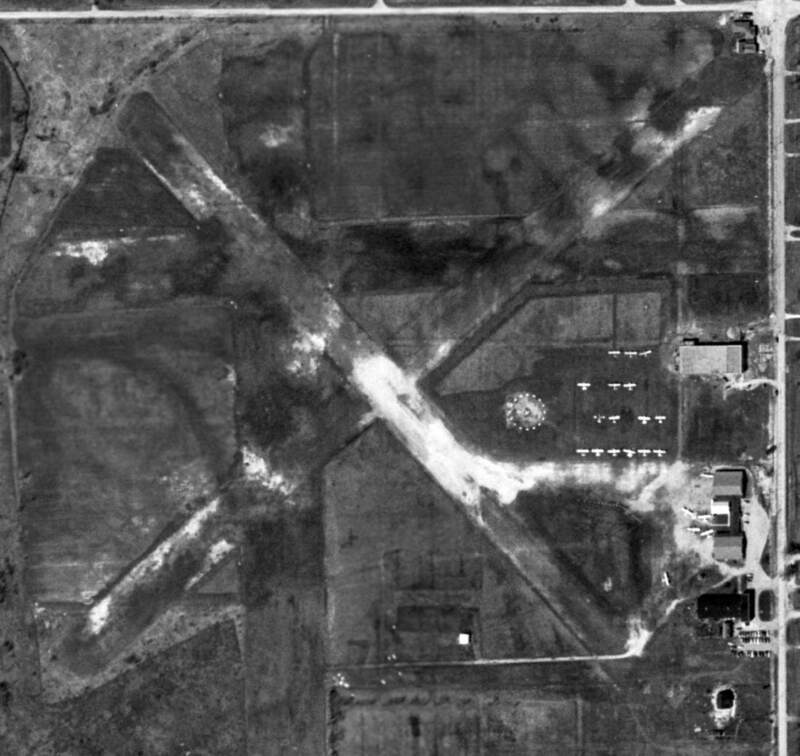 According to Wikipedia, North Farmington High School was built on the site of this airfield in 1961. 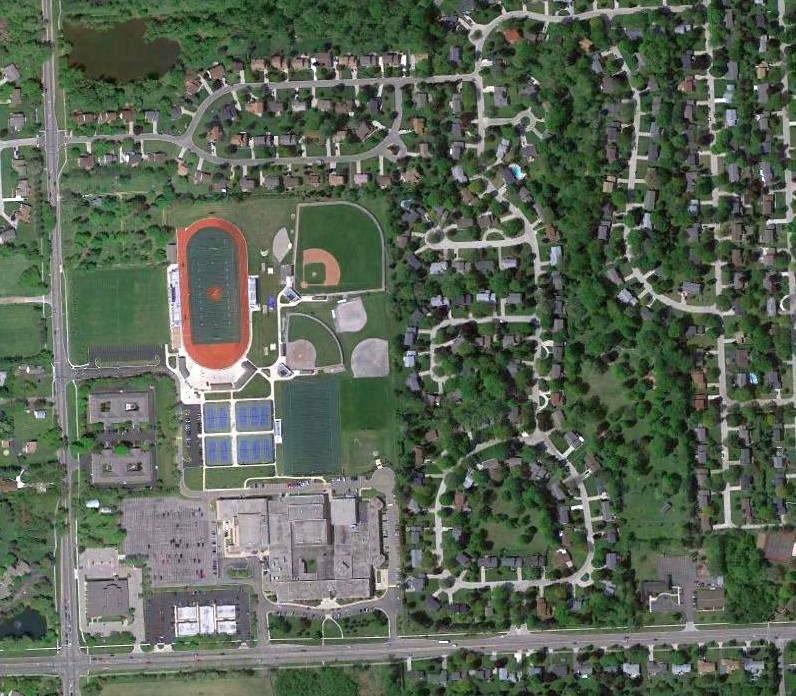 A 2010 aerial view showed North Farmington High School covering the site of the airfield. 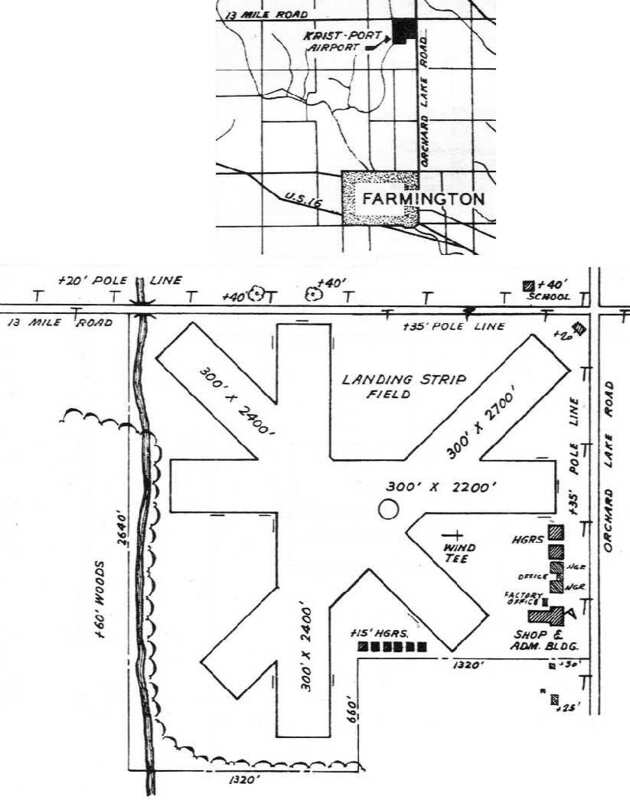 The site of Farmington Hills Airfield is located on the northeast corner of Farmington Road & 13 Mile Road. Thanks to Mike Denja for pointing out this airfield. 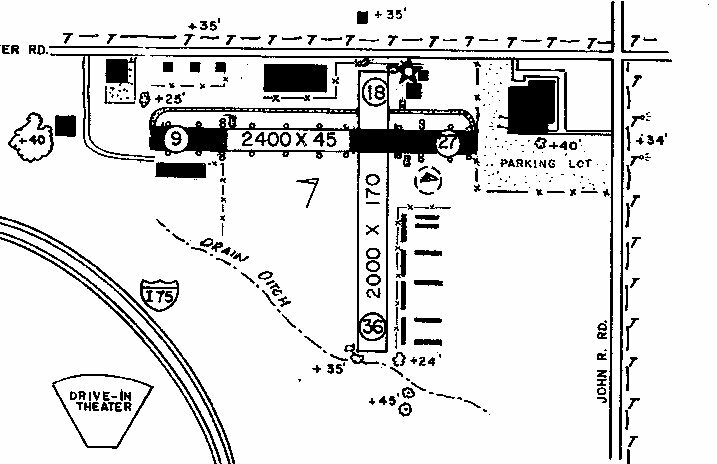 Triangle Airport, as depicted on the June 1931 Detroit Sectional Chart. The date of establishment of Triangle Airport has not been determined. The earliest depiction which has been located of Triangle Airport was on the June 1931 Detroit Sectional Chart. 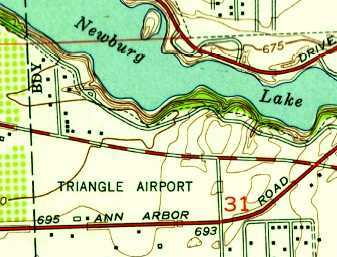 Triangle Airport, as depicted on the 1936 USGS topo map (courtesy of Mike Denja). 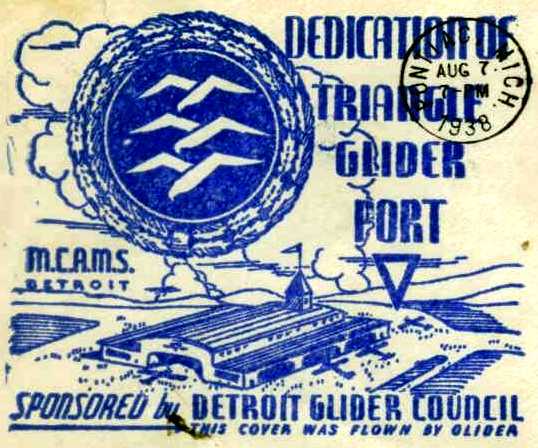 an 8/7/38 postmark (courtesy of Mike Denja) commemorated the “Dedication “of Triangle Glider Port”, “Sponsored by Detroit Glider Council”. It depicted a large hangar, perhaps more elaborate than the reality at this relatively modest airport. 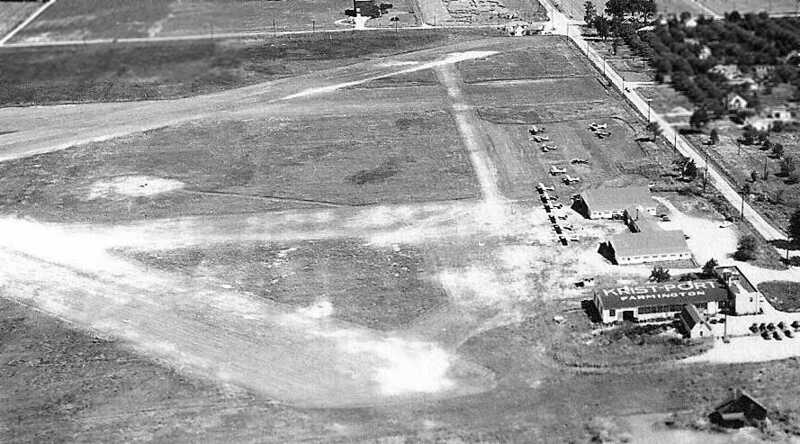 The earliest photo which has been located of Triangle Airport was an undated aerial view looking northeast from an April 1939 article (courtesy of Greg Steinmayer). on which no commercial operator had been able to make a living in recent years. This field was known as Triangle Airport. and, as a result, were almost totally unimpressed. The field was too small; it had obstructions on all 4 boundaries; it just didn't have the makings of a permanent place to fly. However, with the consent of the owner, it was tried out on 4/24/38, by the members of the XYZ Club. They were able to train students, and several of the members had the best flying day they had experienced since our ignominious dismissal from Pontiac Airport. as an unpaved field with several hangars along the soutwest side. with several hangars along the southwest & southeast sides, with at least 3 light aircraft visible at the southeast corner. 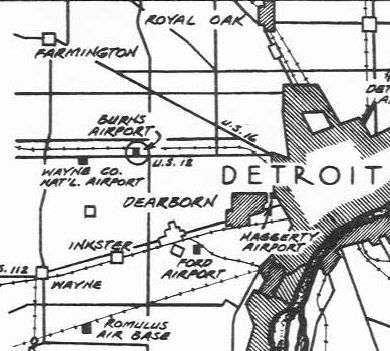 The last aeronautical chart depiction which has been located of Triangle Airport was on the May 1951 Detroit Sectional Chart. It depicted Triangle as having a 2,600' unpaved runway. 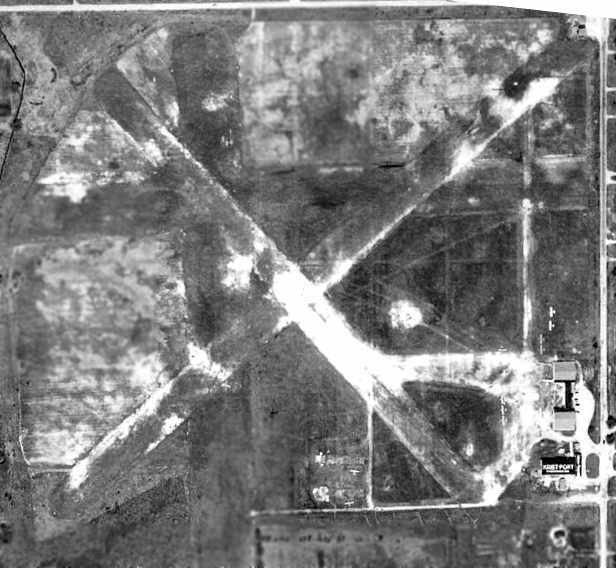 The last photo which has been located of Triangle Airport was a 1952 aerial view (courtesy of Greg Steinmayer). 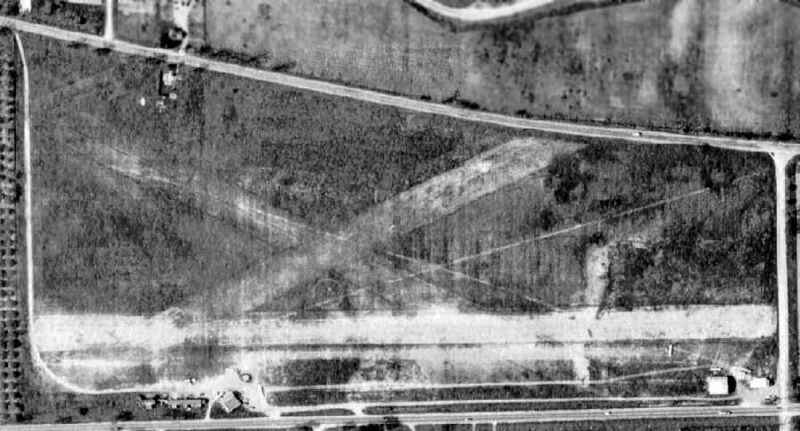 It depicted Triangle as an unpaved field having 3 runways, with several hangars along the southwest & southeast sides, with at least 2 light aircraft visible at the southeast corner. 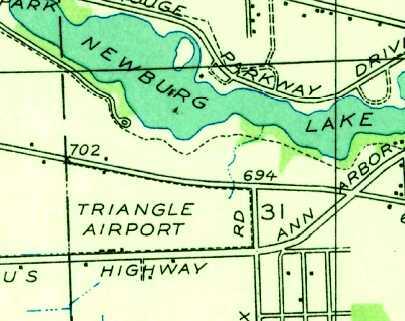 The last depiction which has been located of Triangle Airport was on the 1952 topo map (courtesy of Mike Keefe). but it was not evident whether the airport was still in operation by that point. 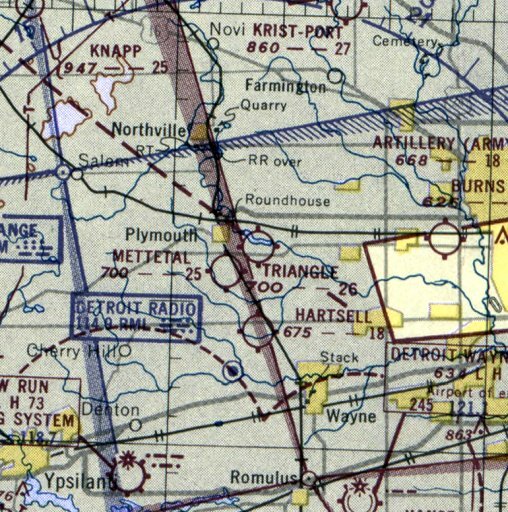 Triangle Airport was no longer depicted on the May 1958 Detroit Sectional Chart. and some of the former dirt-floored hangars have been recycled as retail shops. 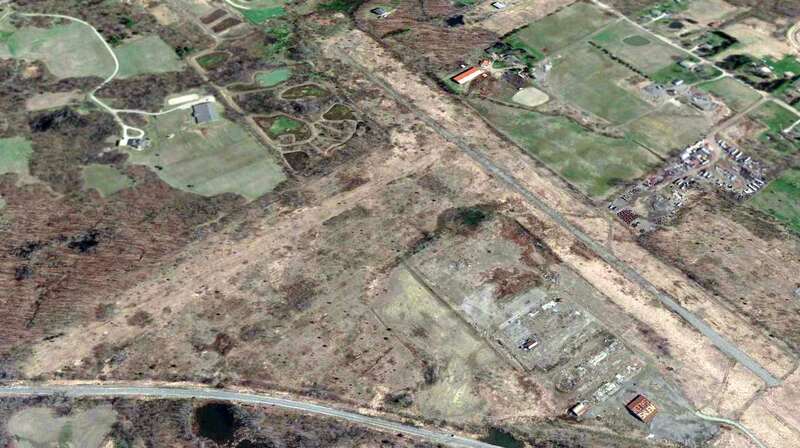 A 5/9/10 aerial view showed no sign remaining of Triangle Airport. 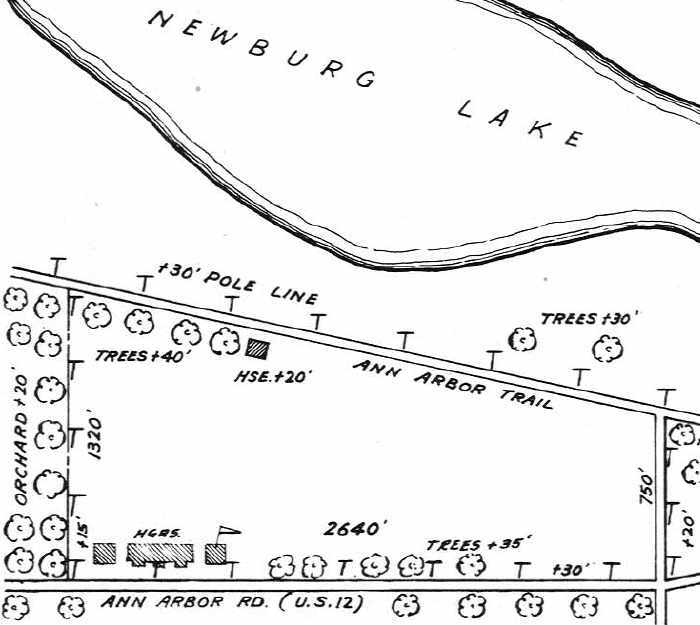 The site of Triangle Airport is located southwest of the intersection of Ann Arbor Trail & Hix Road. A 1941 postmark commemorating the dedication of Krist-Port (courtesy of Mike Denja). 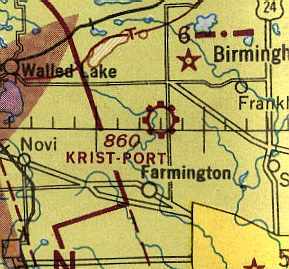 The 140 acre Krist-Port was established in 1936 by Chris Kristiansen (according to the book “Farmington & Farmington Hills”, courtesy of Mike Denja). An entrepreneur, Kristiansen hoped to boost the local economy with an air freight service, and also sold aircraft on the premises. The field initially had 2 runways, each 2,000' long. A 1941 postmark (courtesy of Mike Denja) commemorated the dedication of Krist-Port. and depicted 3 buildings along the east side of the field. It was a busy airport & the Governor at the time would land there when doing business in that area. which was used as a lookout tower for enemy aircraft. was a 10/10/43 aerial view looking north from the 1945 AAF Airfield Directory (courtesy of Scott Murdock). It depicted Krist-Port Airport as having 3 unpaved runways. 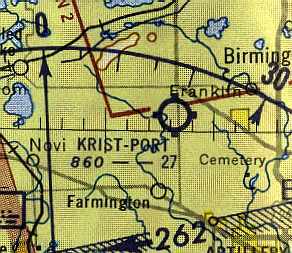 Krist-Port, as depicted on the 1943 Detroit Sectional Chart (courtesy of Mike Keefe). 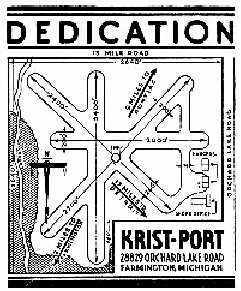 The 1944 US Army/Navy Directory of Airfields (courtesy of Ken Mercer) described Krist Port as having a 2,700' unpaved runway. 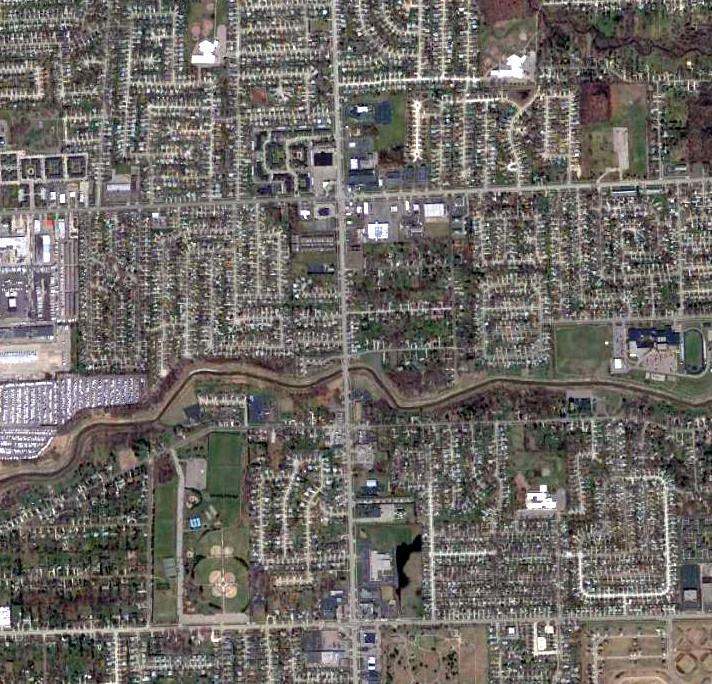 as a 130 acre L-shaped property having 3 earth runways, the longest being the 2,700' northeast/southwest strip. The field was said to have 2 wood & metal hangars, the largest measuring 81' x 80'. Krist-Port was described as being owned & operated by private interests. with the longest being the 2,700' northeast/southwest runway. A total of 10 hangars & buildings were located along the eastern & southern sides of the airfield. showing the 4 unpaved runways, hangars, administration building, and 13 single-engine aircraft. showing the hangars & administration building, with 13 single-engine aircraft. 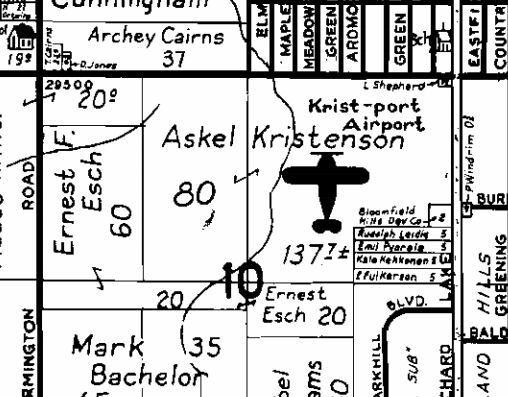 A 1947 Farmington Township Plat Map (courtesy of Mike Denja) depicted the owner of Krist-port Airport as Askel Kristenson. 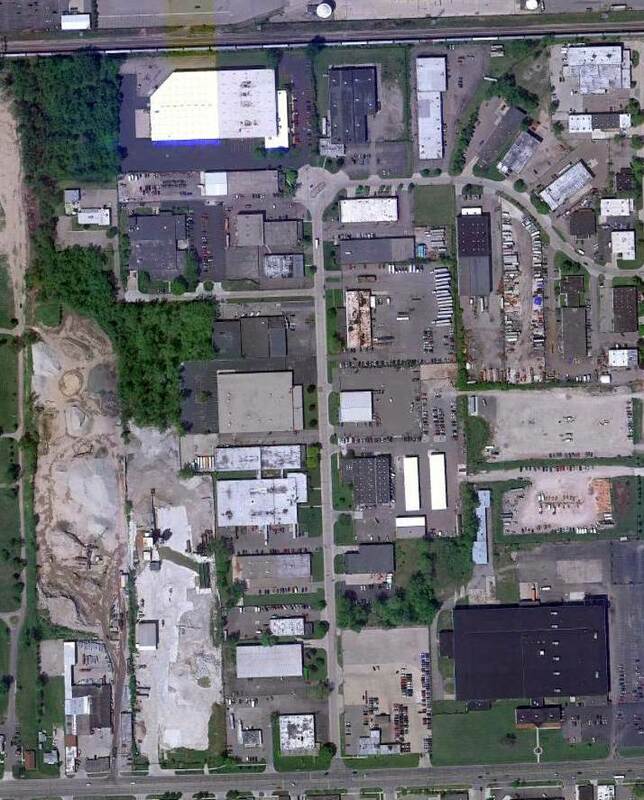 A 1949 Detroit Edison aerial view of Krist Port (courtesy of Mike Denja). Note the shop & administration building at the southeast corner, with "Krist Port" painted on the roof. About a dozen light aircraft were visible on the southeast corner of the field. was entitled “Canadian Planes forced down at Krist Port”. Harold Shobe, manager of the airport, announced Tuesday. Both planes made a safe landing & neither the crews nor the planes were damaged. Shobe stated the planes landed at about 4:30 Tuesday afternoon. 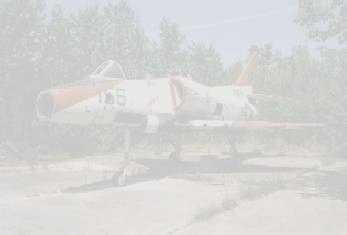 which depicted a total of 23 light aircraft on the southeast corner of the field. 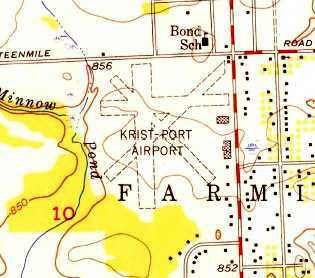 The 1952 USGS topo map depicted Krist-Port Airport as having 3 unpaved runways, with several buildings along the east side. from January 1952 through at least 1955 (according to articles courtesy of Mike Denja). depicted Kris Port as a commercial airport having a 2,700' unpaved runway. before he moved to Wayne County & established Wayne County Flying Service, where I learned to fly in 1954-1955. Cliff Waeschle recalled, “I remember Kristport well. I worked there in the summer of 1955 when it was still operational as an airport. I got hired as line boy to clean up the offices, pump gas, mow the grass runways & help the A&P mechanic Ray do general maintenance. How I loved repacking wheel bearings, sand blasting plugs etc. The owners were two WWII vets that ran the flight school - Chuck Spicer & his buddy Johnny. 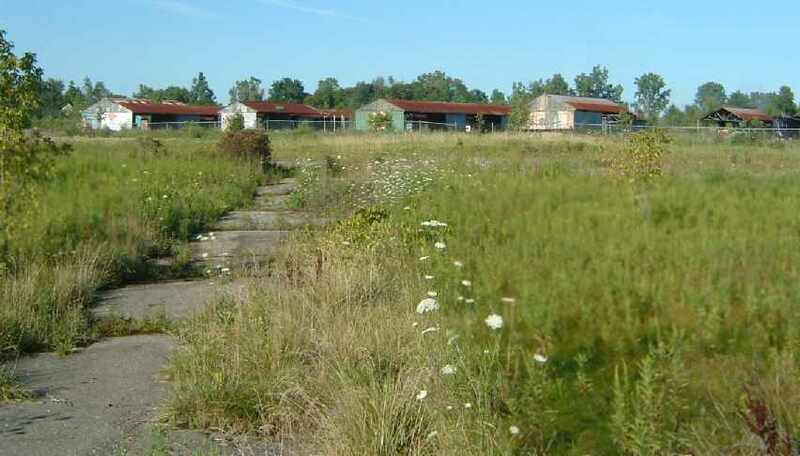 as an article (courtesy of Mike Denja) mentioned that the airfield was "abandoned" by 1955. Krist Port was no longer depicted on the May 1960 Detroit Sectional Chart (courtesy of Mike Keefe). 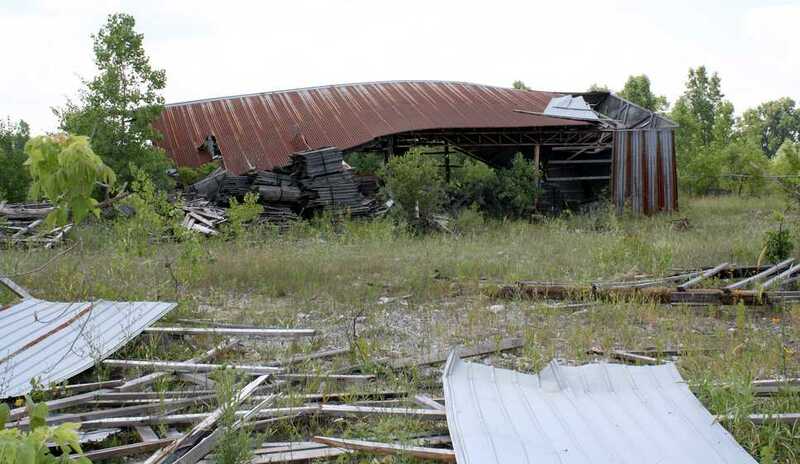 but the administration building & hangar still remained standing on the east side. A 2003 photo by Michael Denja of the front of the former shop & administration building of Krist Port. A 2003 photo by Michael Denja of the hangar portion of the former shop & administration building of Krist Port. which remains atop the former shop & administration building of Krist Port, by Michael Denja, 2003.
that I was told was the former control tower of the airport. 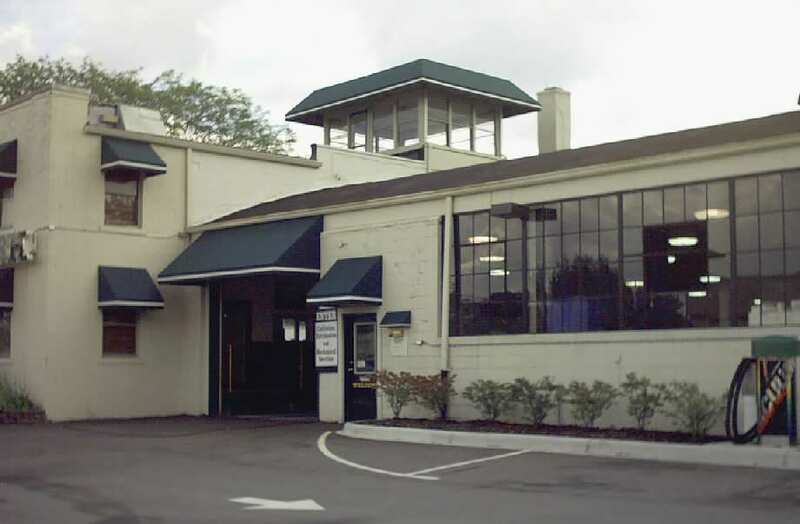 The building is now an auto repair shop & has since been renovated & added to but the top does look like a control tower. It has 360 panoramic windows." A circa 2005-2010 aerial view looking east at the former shop & administration building of Krist Port. but the former shop & administration building remained standing along the east side of the property. The site of Krist Port is located on the southwest corner of Orchard Lake Road & 13 Mile Road. Salem Airport, as depicted on a 1967 aerial photo (courtesy of Mike Denja). nor on the July 1965 Detroit Sectional Chart (according to Chris Kennedy). 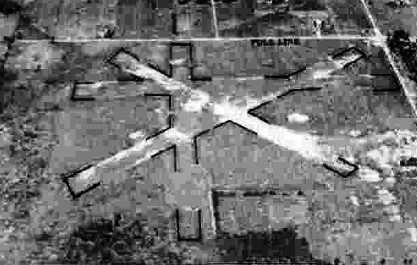 The earliest depiction of Salem Airport which has been located was on a 1967 aerial photo (courtesy of Mike Denja). 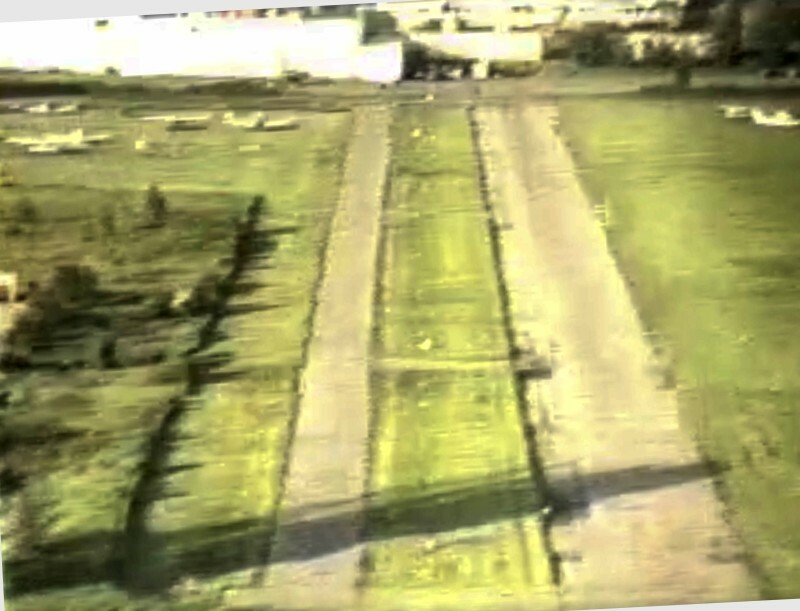 It depicted Salem Airport as having a single paved north/south runway. as having a single 2,700' paved runway. 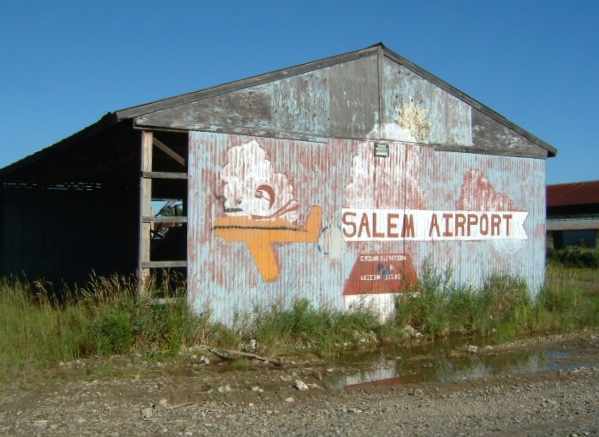 depicted Salem Airport as having a single 2,900' paved Runway 18/36 & a 2,200' unpaved Runway 9/27. 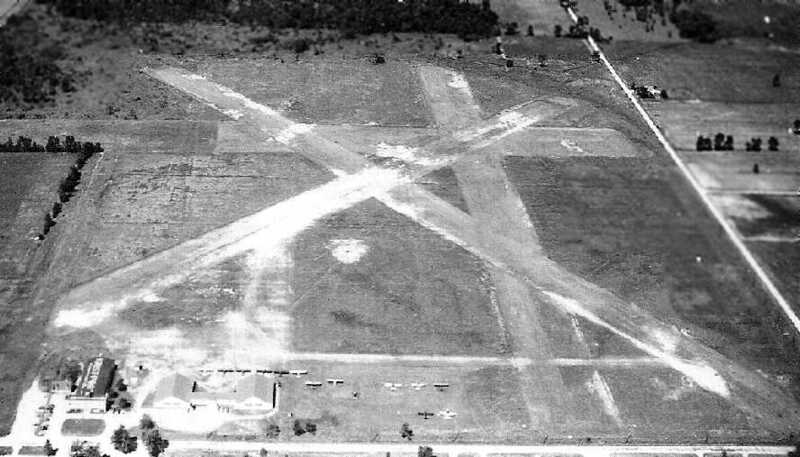 The crosswind runway had evidently been added at some point between 1967-71.
and another building was depicted on the southwest side of the field. 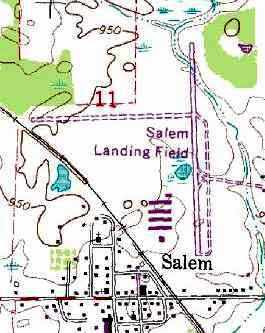 The 1973 USGS topo map depicted "Salem Landing Field"
as having a paved north/south runway & 3 rows of T-hangars & a smaller building at the southwest end of the field. A 1973 aerial view depicted Salem Airport as having a single paved north/south runway & and unpaved crosswind runway. and a total of 16 light aircraft were parked on the southwest & southeast sides of the field. and to the west 2/3 of the way to the railroad tracks. That was a pea gravel landing target for parachuters. It [ the Para-Hawks jump operation] was run by Pete & Nora Myks of Detroit until 1976 when Ron Shuebridge owned it. I personally made 1,004 jumps there. We had the last hangar on the left in the 2nd row south with a training mockup air plane & suspended harness. 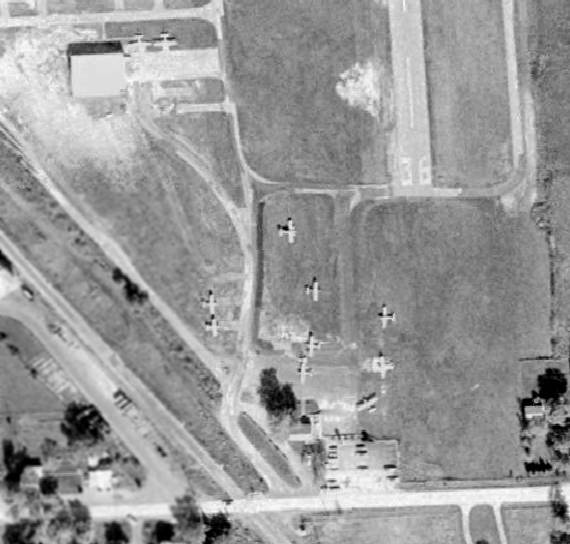 A closeup from the 1973 aerial view, showing some of the planes parked on the southwest side of Salem Airport. Tom Korzeniowski recalled, “I remember doing my primary flight training in 1973 at Salem Airport, where Don Little was my instructor. I believe he was named 'Flight Instructor of the Year' in 1972. I don't recall there having been a unpaved east/west runway in 1973.
which was owned by a Ron Shoebridge, a man in the asphalt paving business. The airport office was in a tiny building just off [6 Mile] Road & to the left of Runway 36. Tim Rawlings recalled, “Ron Shoebridge owned the airport/property back into the 1960s. Ron cleared the trees to put in the runway & lived just east of the airport on the 'old taxiway' / tiedown area. My dad took his instructor checkride from Don little there then taught there I think as early as 1971 or 1972. I washed & degreased the school planes & others for money as a kid. I was in about 2nd to maybe 8th grade when I hung around while my dad taught in the summers & weekends. So many memories of the characters who drank the coffee & the regulars who flew in for chit chat. I recall the 'Wixom Airforce': a pair of older guys who would fly in formation in their C-170s. as having a single 2,800' paved runway. and 4 rows of T-hangars & 2 other buildings at the southwest end of the field. 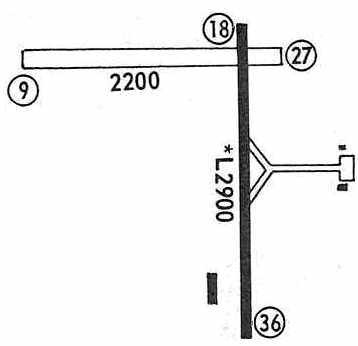 The 1982 AOPA Airport Directory (courtesy of Ed Drury) described Salem Airport as having a 2,850' asphalt Runway 18/36 & a 2,200' turf Runway 9/27. The field was said to provide fuel, repairs, hangars, tiedowns, flight instruction, and plane rental. The operator was listed as Salem Airport Inc. (a Cessna dealer). Cal Locklin recalled, “I was also told that it was because the landfill wanted to expand. and the potential problems the birds would create. 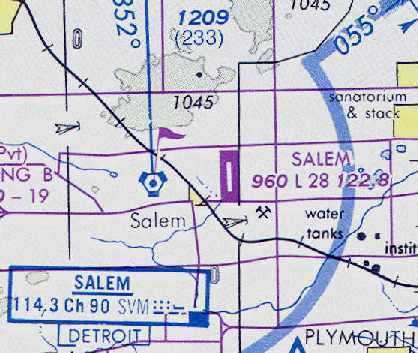 Salem Airport was no longer depicted at all on the 1998 Detroit Terminal Area Aeronautical Chart. According to Randy Coller (of MDOT-Aeronautics), “There was a proposal to construct a landfill near the airport. Since state & federal law discourages such activity in close proximity to public use airports, the state opposed the proposed landfill. The proponent (Halloway Construction) then bought the Salem Airport & closed it so they could develop the landfill. 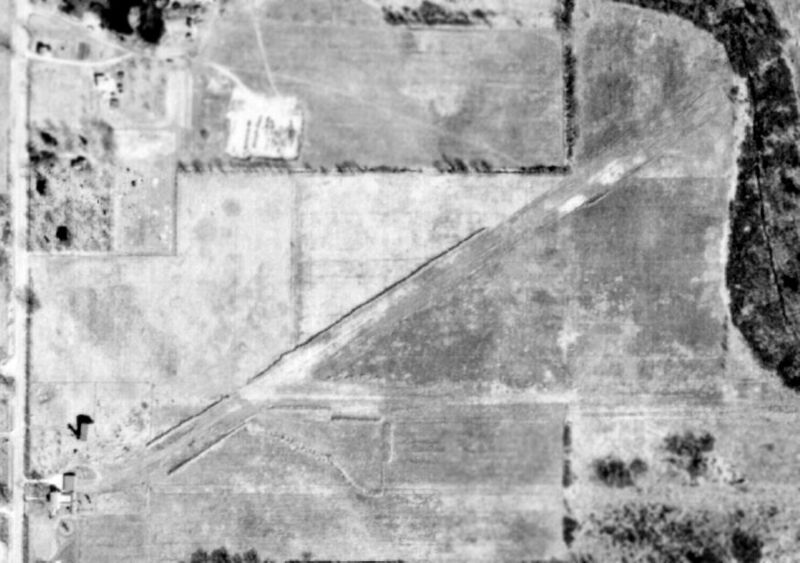 In a 2000 USGS aerial view looking northeast, the Salem Airport appeared to be abandoned. Five rows of T-hangars were visible on the southwest side of the field, but large portions of 2 of the buildings had fallen down (or been demolished). Another building (a hangar?) sat to the south of the T-hangars. All sorts of trailers & junk appeared to be stored on the field, east of the hangars. 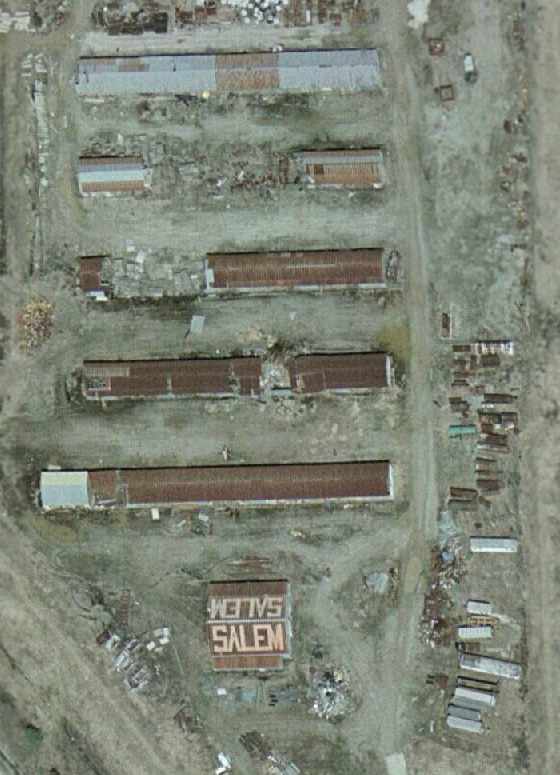 In the 2002 USGS aerial photo, 3 of Salem Airport's T-hangars had been partially demolished. Note the painted "Salem" visible on the roof of the individual hangar at the south end of the T-hangars. The pavement of the north/south runway remained intact, but it appeared to be quite deteriorated. 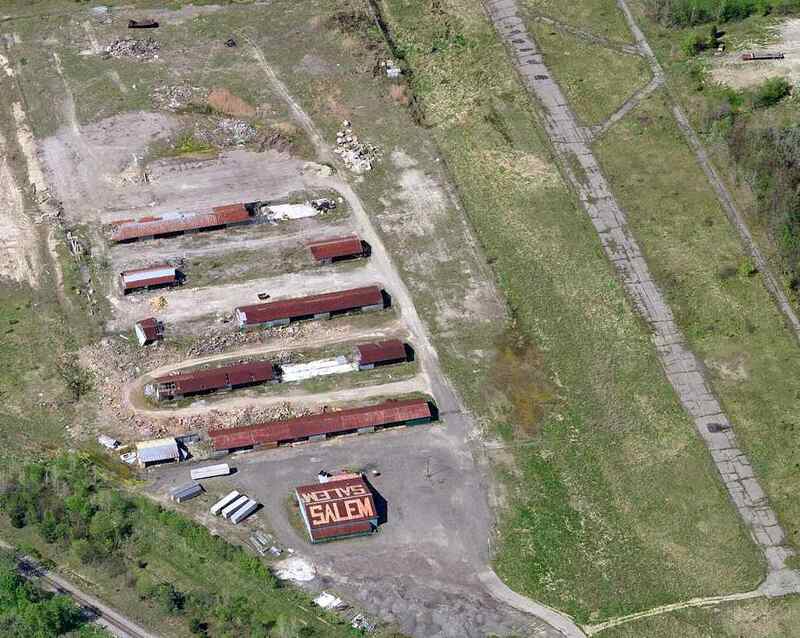 A closeup of Salem Airport's partially demolished hangars, from the 2002 USGS aerial photo. 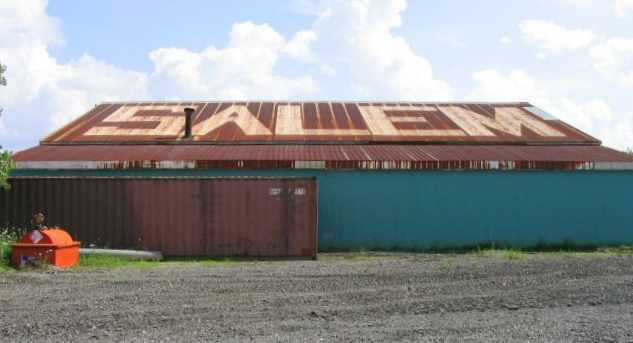 A 2004 picture of the hangar with "Salem" still painted on the roof. 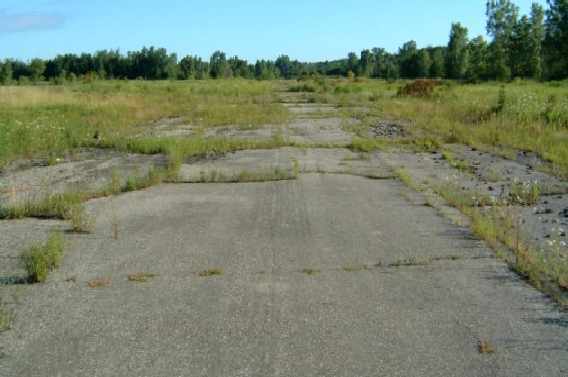 An 8/2004 photo by Greg Steinmayer of the hangars & runway pavement at Salem Airport. Greg Steinmayer visited the site of Salem Airport on 8/2004. they may be preparing to redevelop the property (it is only a few miles from Ann Arbor). The runway is VERY badly deteriorated, with the painted orange X's at each end almost completely vanished. and been cut down (in fact there is an orange highway barrel covering the stump of one). I saw no evidence of the branch of the taxiway going east that is shown on the map from the 1971 Flight Guide." 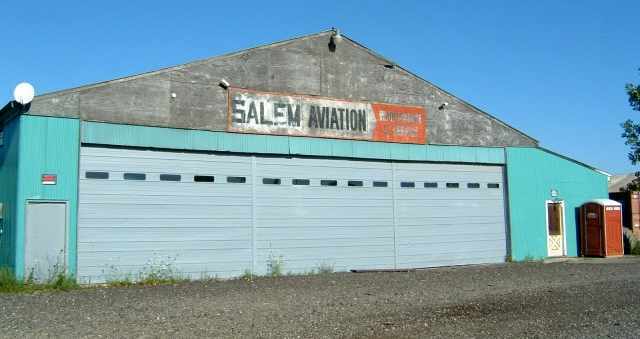 An 8/2004 photo by Greg Steinmayer of the faded sign on the end of a former T-hangar at Salem Airport. An 8/2004 photo by Greg Steinmayer of the former main hangar at Salem Airport. An 8/2004 photo by Greg Steinmayer looking along the remains of the pavement of Salem's runway. An 8/2004 photo by Greg Steinmayer of the remnants of painted runway markings. with the runway still intact & the hangars still standing. A circa 2010 aerial view looking north at the sad remains of Salem Airport's hangars & runway. Russ reported in 2011, “I am a project manager for Holloway Company. We will be working on the property soon; most of the hangars are ready to fall on their own. A July 2011 photo of the former main Salem Airport hangar by John Penrice. John reported, “I’ve lived within 10 miles of it for almost 50 years & never knew it was there. 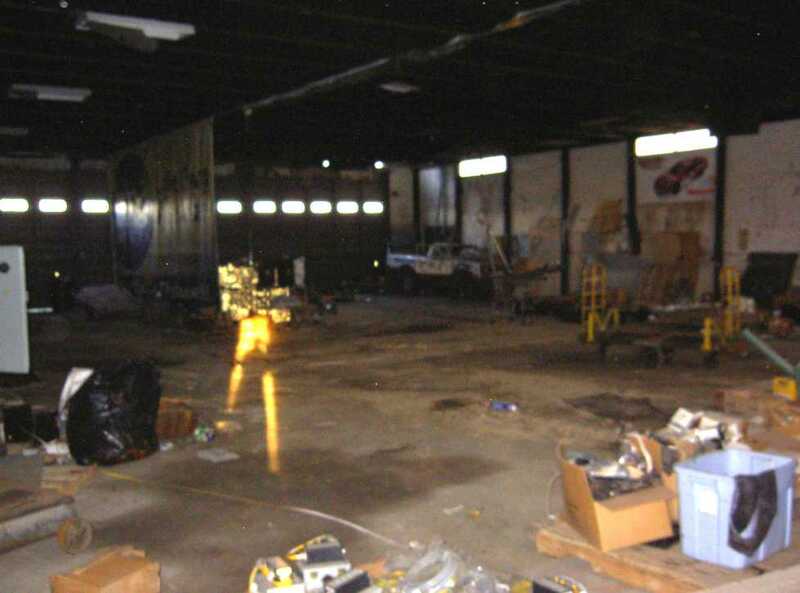 A July 2011 photo of the interior of the former Salem Airport hangar by John Penrice. A July 2011 photo of the last remaining T-hangar at Salem Airport hangar by John Penrice. 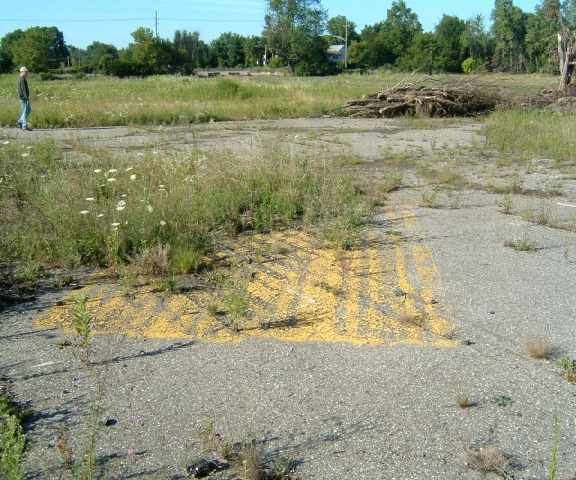 A July 2011 photo by John Penrice of the remains of Salem Airport pavement. A 2016 aerial view looking northeast showed that Salem Airport's paved runway remained intact though deteriorated, and the hangar marked “Salem” still remained standing. 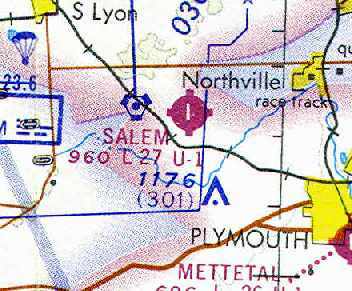 The site of Salem Airport is located northeast of the intersection of Salem Road & 6 Mile Road. Thanks to Gsteinma for pointing out this airfield. 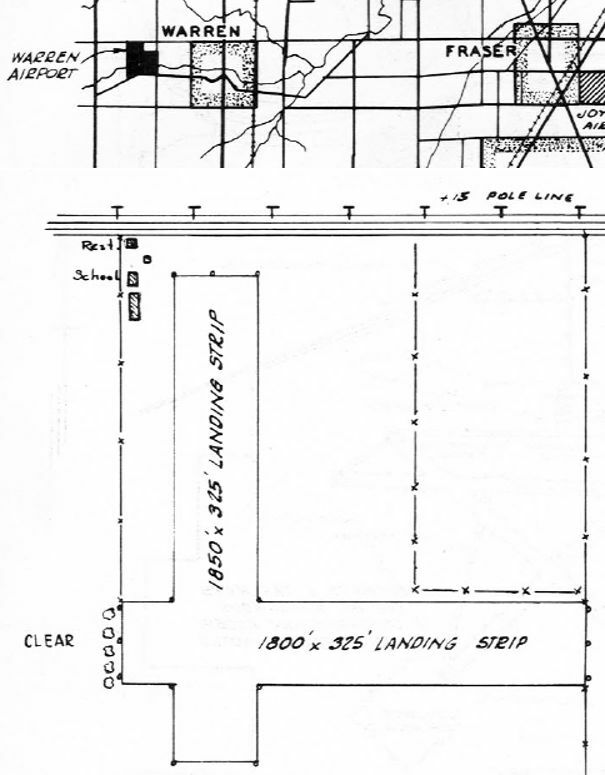 John R. Airport, as depicted on the 8/8/29 Commerce Department Airway Bulletin (courtesy of Derek Spinei). This property has been the location of 2 different airports throughout the decades. It was originally known as John R. Airport. The date of establishment of John R. Airport has not been determined. on the 8/8/29 Commerce Department Airway Bulletin (courtesy of Derek Spinei). having 2 sod runways, measuring 3,000' east/west & 2,600' north/south. The owner & operated was listed as the Robert Anderson Company. all associated with the Detroit Eaglerock Sales Corporation & the Avian Flying Club of Detroit, which was noted to jointly operate the airport. or the May 1945 Detroit Sectional Chart (according to Chris Kennedy). as the Big Beaver Airport was established in 1946 on the same location, with a 2,400' gravel runway. was owned & operated by his surviving daughter, Anna Main, until her death. was on the July 1946 Detroit Sectional Chart (courtesy of Chris Kennedy). It depicted Big Beaver Airport as an auxiliary airfield. as having 2 perpendicular 2,150' runways, with an office on the northeast side. 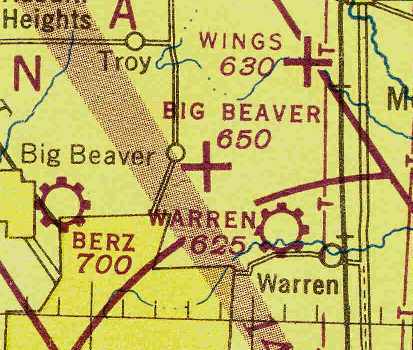 Big Beaver Airport, as depicted on the 1949 Detroit Sectional Chart (courtesy of Donald Felton). which showed the field to have a single east/west runway. and another aircraft was at the west end of the runway. The earliest topo map depiction which has been located of Big Beaver Airport was on the 1952 USGS topo map (courtesy of Mike Denja). It depicted Big Beaver Airport as having 2 unpaved runways with one building along the northeast side. A circa 1950s photo of a unidentified glider being towed aloft at Big Beaver Airport. A circa 1950s photo of a a family in front of a unidentified glider, with another coming in to land, at Big Beaver Airport. and listed the operator as John Main. A 1964 aerial view depicted Big Beaver as having a gravel east/west runway & a grass north/south runway. A single building was on the north side of the field. A total of no less than 53 light aircraft were visible parked on the field. An August 1964 photo of Rich Connell admiring a Cessna 190 at Big Beaver Airport. 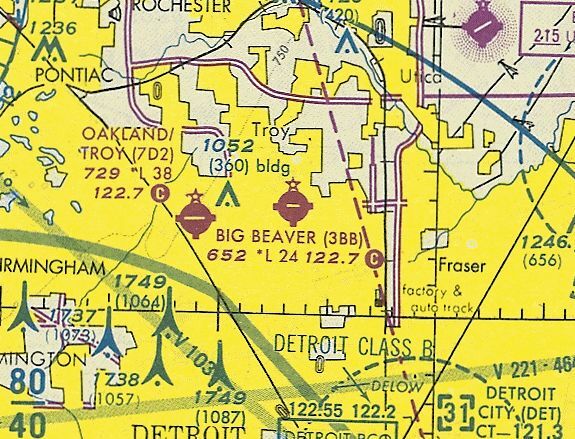 Big Beaver was still depicted as having a 2,400' unpaved runway on the July 1969 Detroit Sectional Chart (courtesy of John Voss). the size of one small room (small square shadow east of the hangar in the 1973 picture), and an outhouse (can't pick it out in the picture). [Runway] 9/27 was paved, but we used to land on the grass along the south side of the runway parallel to the pavement. with a total of 44 light aircraft parked on the north & south sides of the field. Runway 9/27 had also been paved at some point between 1969-73. The grass crosswind runway appeared to still be maintained as well. somehow he ended up designing a new hangar / office building with indoor plumbing that you can see in the 1977 photo. Quite an upgrade. There was pretty tall building built a couple miles east about that time as well. In the little [Cessna] 120 you couldn't climb fast enough in the summer to get over it so you had to make a bit of a jog around it. The Beech 18 parked by Big Beaver Road... I only recall one being there - but the owner would come out each summer & polish a few square feet of it & quit. by the time of the 1976 Detroit Sectional Chart (courtesy of Mike Keefe). depicted Big Beaver Airport as having a single 2,400' paved east/west runway. 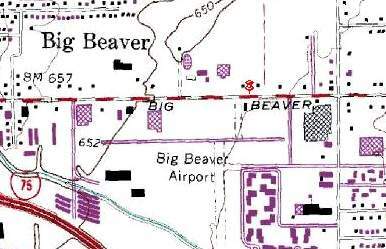 The 1980 USGS topo map depicted Big Beaver Airport as having a paved east/west runway. as having a 2,400' asphalt Runway 9/27 & a 2,100' sod Runway 18/36. The operator was listed as Big Beaver Airport Inc.
and during that time there were 2 derelict Twin Beech's close to the road." John Fordon recalled, “In 1986 I learned to fly at the Big Beaver Airport. This was a very special place. as having a 2,400' paved Runway 9/27 & a 2,000' unpaved Runway 18/36. A still image from a 6/11/89 video by John Ellis looking east from final approach to Big Beaver Airport's Runway 9. 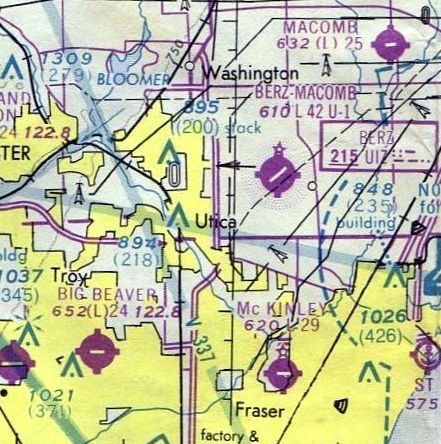 The last aeronautical chart depiction which has been located of Big Beaver Airport was on the October 1993 Detroit Sectional Chart (courtesy of Ron Plante). It depicted Big Beaver Airport as having a single 2,400' paved east/west runway. which depicted 5 single-engine aircraft still on the field, which was clearly on its last legs by that point. John Ellis recalled, "I kept my Piper Tomahawk there until it closed. After her brother died, Anna Main owned & operated the airport until her death & the airport closed. She was never married & had no family but was somewhat of a legend to the fliers in the area. and the field would have to close which is exactly what happened." Big Beaver Airport reportedly closed in 1997. 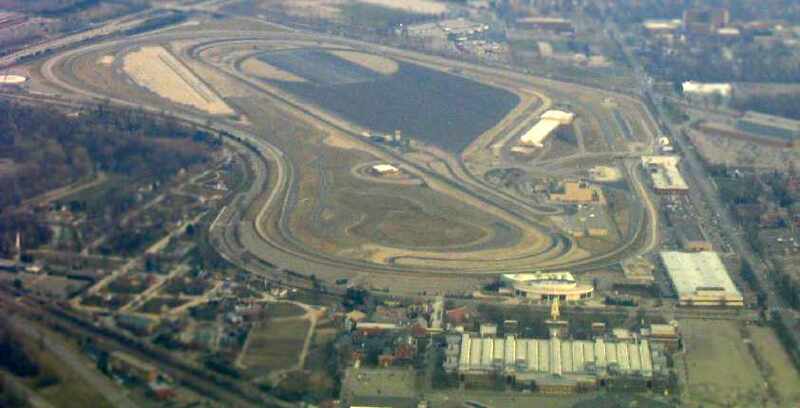 A 1999 USGS aerial photo showed that the runway had already been largely obliterated, with new buildings having been constructed on the site. Greg Srteinmayer reported, “The Big Beaver Airport has been consumed by light industrial & office buildings." In 2017 aerial view, no trace of Big Beaver Airport was still recognizable. 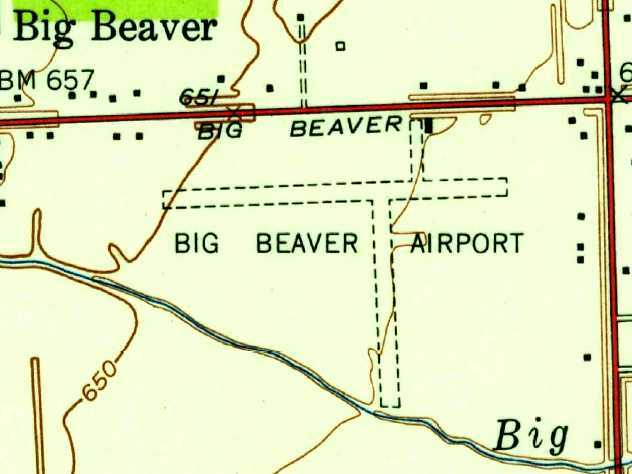 The Big Beaver Airport was located southwest of the intersection of East Big Beaver Road & John R Road. Thanks to Neil McNeight for pointing out Big Beaver Airport. showing several unidentified biplanes & monoplanes. 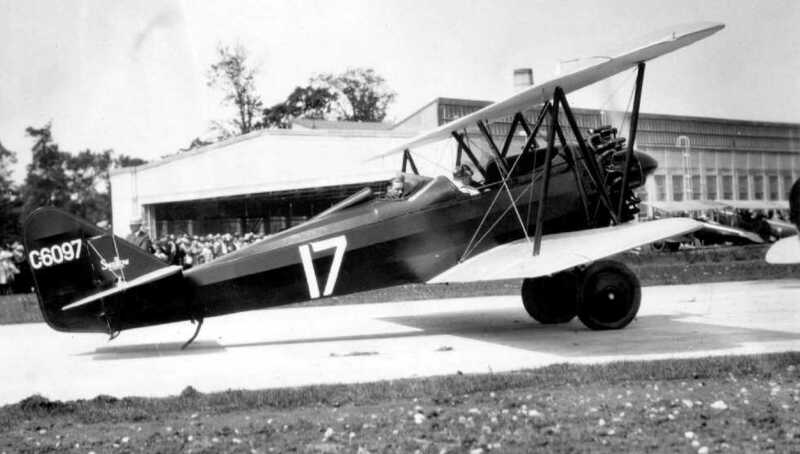 he had a 2nd Stout airplane factory built on the corner of Oakwood & Village Road. The 20,000 square foot Stout Metal Airplane Company factory opened in 1924. 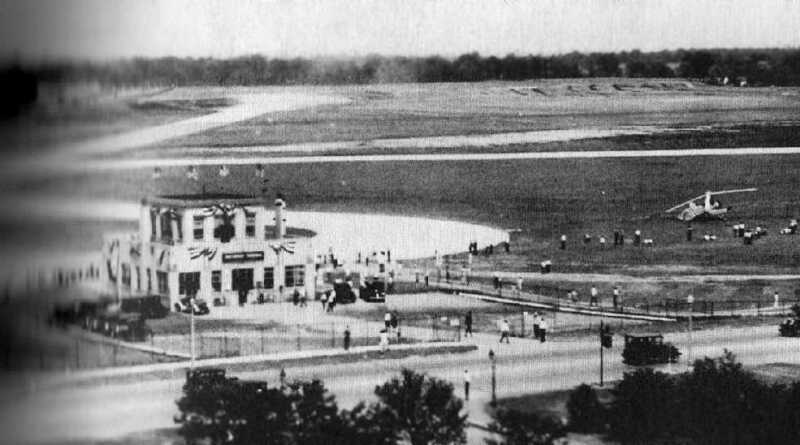 In 1925, the Ford Airport was dedicated, with 2 grass runways & flood lights for night landings. It was widely touted as being the first "modern" airport in the world. with the Ford Air Transportation Service providing a route between between "Detroit" (Dearborn) & Chicago. the first in the world to have a hotel (the Dearborn Inn) designed & built for the air traveler. 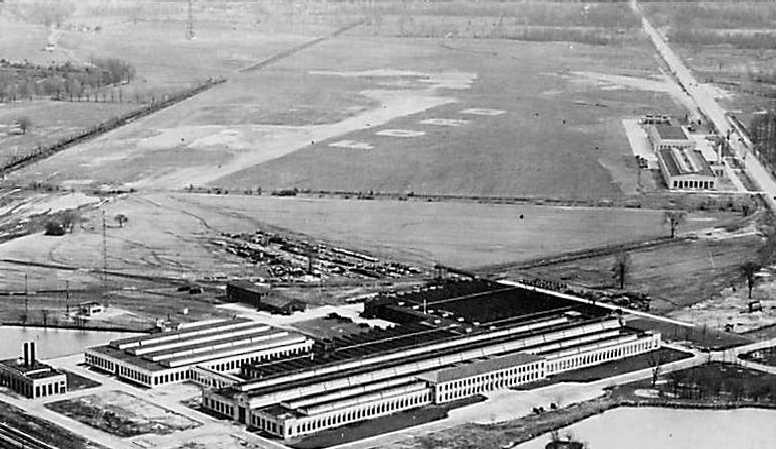 The Ford Motor Company Airplane Division manufactured aircraft at this location starting in 1925. Henry Ford errected the largest, most modern and only privately owned permanent dirigible mooring mast in 1925.
started & ended at Ford Airport. using system developed by Ford Motor Company. The Army's RS-1 blimp, moored at the Ford Airport in 1926. 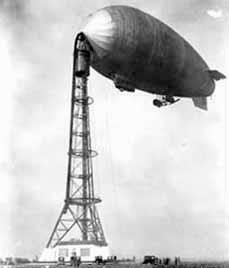 Ford Airport's dirigible mast was reportedly only used twice. 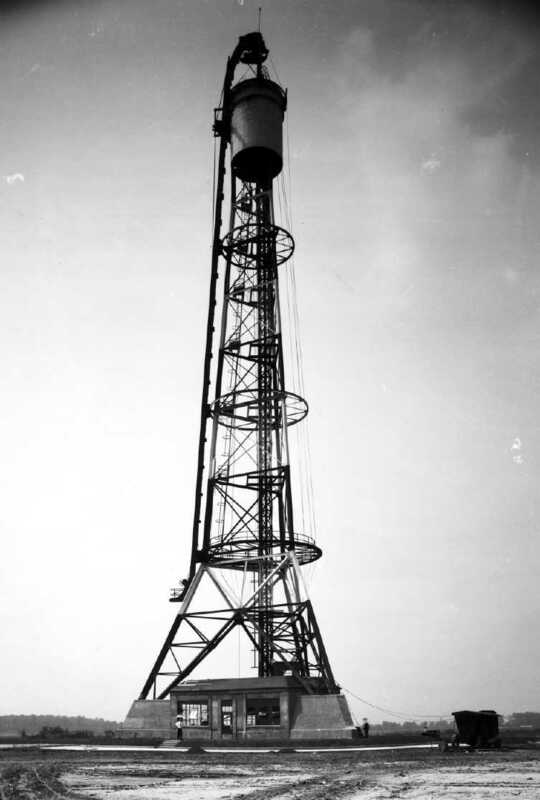 An undated view of Ford Airport's dirigible mooring mast (from Wayne State University's Virtual Detroit website, via Mike Denja). 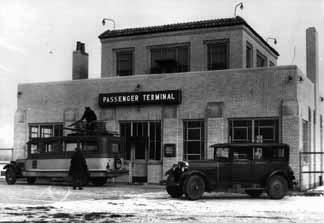 A 1926 photo of the passenger terminal at Ford Airport. According to Michael Kuentz, Stout aircraft had a poor flight record, suffering many crashes. and on the night of 1/27/26 a fire mysteriously started in the all-brick & steel plant, destroying the building. and the other, the world's first airport hotel (The Dearborn Inn). "For the first time in my life I have bought a lemon, and I don’t want the world to know about it", in regards to the puzzling fire. Never again would the Stout name appear on an airplane factory. Eventually Henry Ford bought out William Stout & turned his transportation company into Ford Air Transport. A circa 1927 photo by Nick Kankula (courtesy of Paul Kankula) of a Swallow with a J-5 engine at an airshow at Ford Airport. 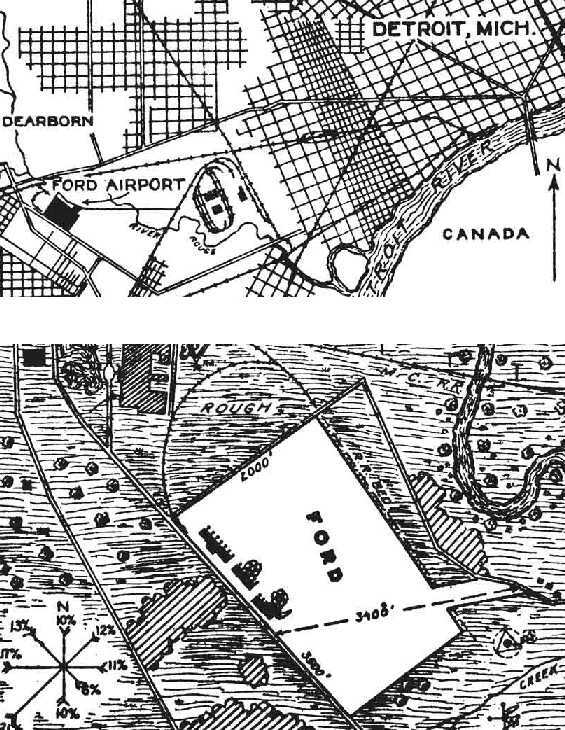 The location & layout of Ford Airport, as depicted on a 1927 Department of Commerce Airway Bulletin (courtesy of David Brooks). The Bulletin described Ford Airport as a 600 acre irregularly-shaped property with the longest dimension being 3,500' northwest/southeast. A row of buildings were depicted along the southwest side. 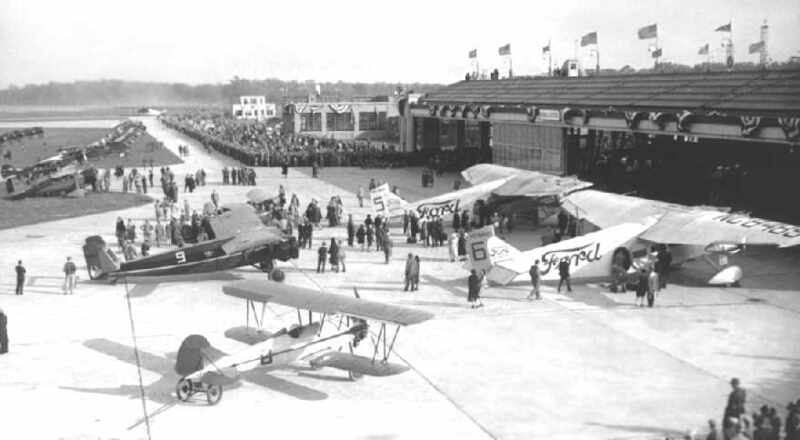 A photo of 4 Ford Trimotors at Ford Airport on or near the 6/27/27 start of the 1927 Ford National Reliability Air Tour. and NC2435, the 1st Ford Trimotor, serial # 4-AT-1. 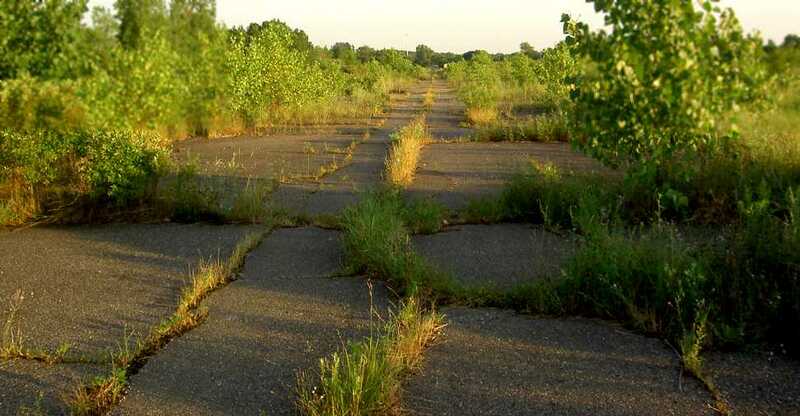 From 1928-29 Ford Airport's grass runways were paved – giving the field the 1st concrete runways in the world. An undated (circa 1920s?) 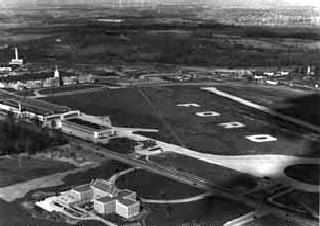 aerial view looking east at the Ford engineering labs in the foreground, with the Ford Airport & hangars behind. An undated aerial view looking north at the Ford Airport terminal, showing an autogiro on the right (courtesy of Jonathan Westerling). 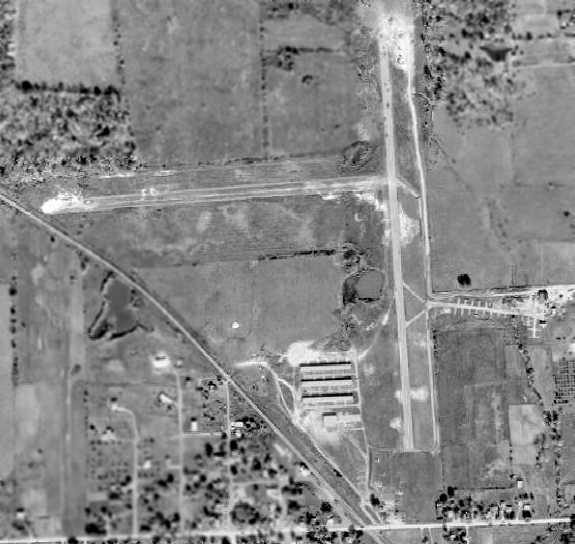 A 1931 aerial view looking northwest at Ford Airport. Henry Ford built the Dearborn Inn (opening in 1931) to accommodate overnight travelers arriving at the Ford Airport. the 179-room inn was the world's first airport hotel. The guest quarters along Pilots Row originally were used by the airlines' crews. (from Wayne State University's Virtual Detroit website, via Mike Denja). Note also the 3 balloons visible at the top of the photo. The earliest aeronautical chart depiction which has been located of Ford Airport was on the June 1931 Detroit Sectional Chart. Note the blimp mooring mast symbol. “Henry Ford's interest in aviation waned in the early 1930s. The last flight of the Ford Air Transportation Service was in 1932. Unfortunately, Henry Ford lost more than $10 million on his airplane division, which closed in 1933. A total of 199 Ford Tri-Motors were eventually built at the Dearborn facility. The Tri-Motor was the 1st American all-metal, multi-engine, commercial airliner. during their takeoff from Ford Airport on a record-setting flight to an altitude of 57,579', almost 11 miles up. 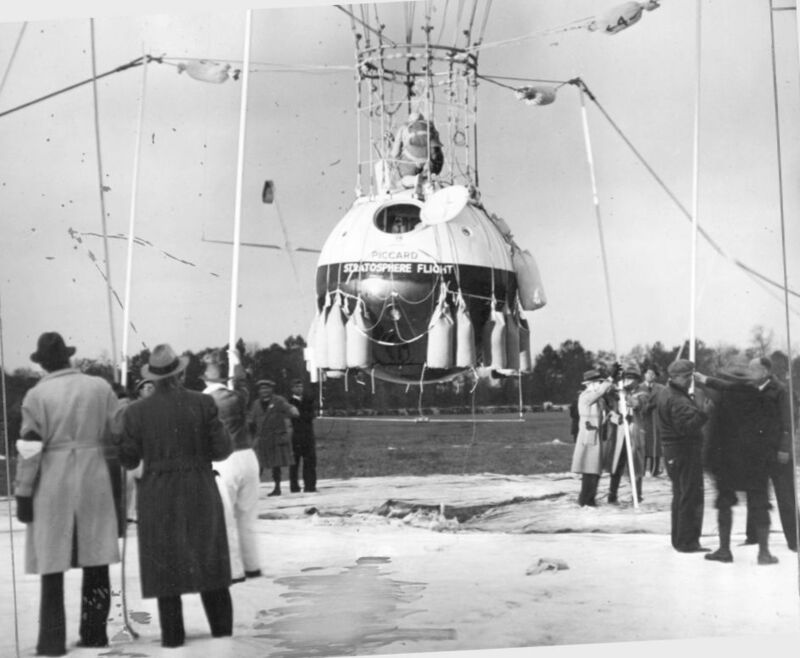 The Piccards’ intention was to reach the stratosphere, both to set an altitude record & to collect scientific data. Jeanette set the women’s altitude record which held for almost 30 years. As the Piccards’ pet turtle was also along for the ride, it is likely that it also set the unofficial altitude record for turtles or reptiles of any kind. They had been training at the airport where Jeannette, the pilot of the craft, worked to become the first licensed female balloon pilot in the U.S.
Henry Ford even allowed them to use his hangar. 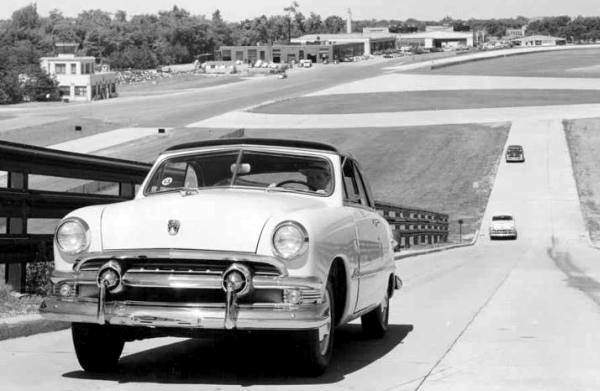 In 1938 the 1st automobile test track was laid down on the Ford Airport property. 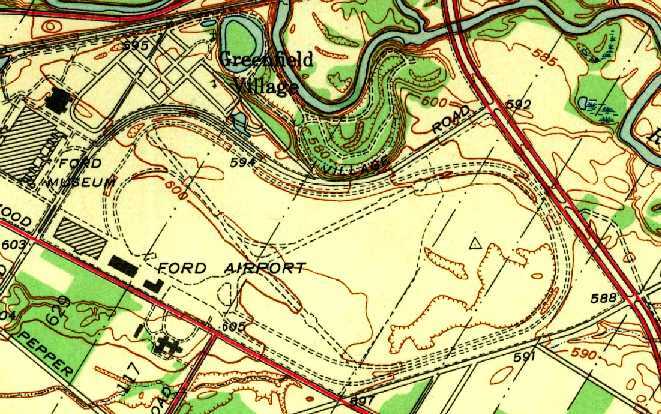 The earliest topo map depiction which has been located of Ford Airport was on the 1942 USGS topo map (courtesy of Mike Denja). with several buildings along the southwest side. 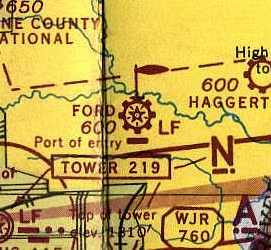 Ford Airport, as depicted on the October 1943 Detroit Sectional Chart (courtesy of Mike Keefe). was a 10/10/43 aerial view looking east from the 1945 AAF Airfield Directory (courtesy of Scott Murdock). 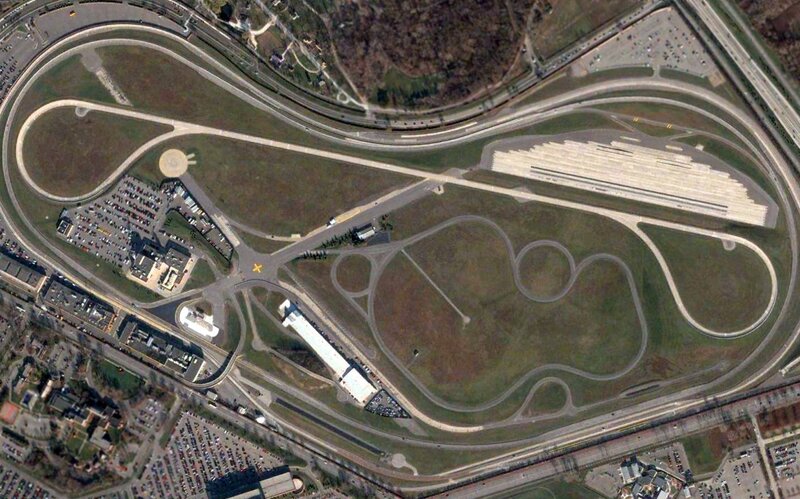 It depicted the field as having 2 concrete runways within the test track. as a 300 acre irregularly-shaped property having 2 concrete runways, measuring 3,700' northwest/southeast & 3,200' northeast/southwest. Ford Airport was still depicted as an active private airfield in the 1946 MI Airport Directory (courtesy of Doug Ranz). It was depicted as having 2 concrete runways (3,700' & 3,200'). 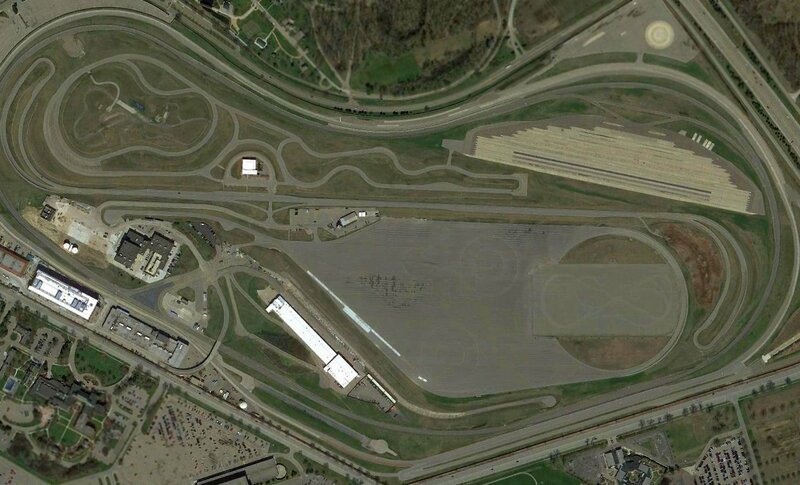 with an automobile test track extending beyond the runways. 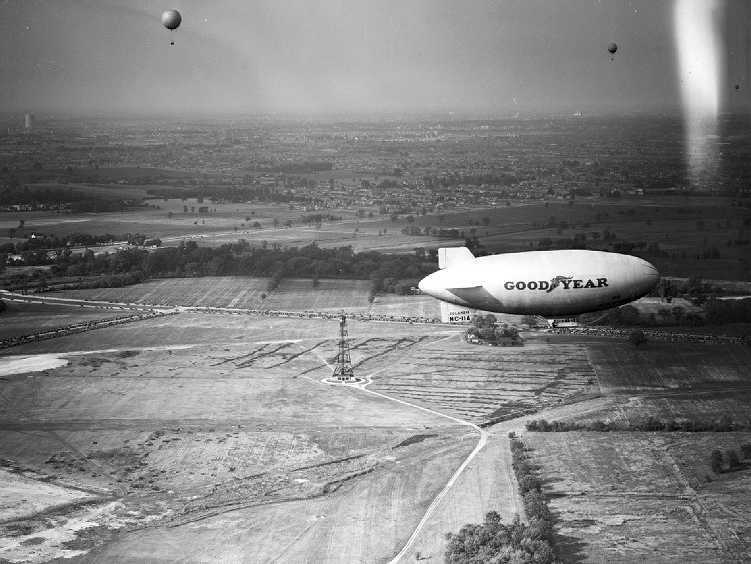 Ford Airport's dirigible mooring mast was demolished in 1946.
was a circa 1940s photo of a blimp being moored at Ford Airport (from Wayne State University's Virtual Detroit website, via Mike Denja). Note that this blimp appears to be a military surplus K-type airship reused for civilian purposes after WW2. Ford Airport was no longer depicted at all. 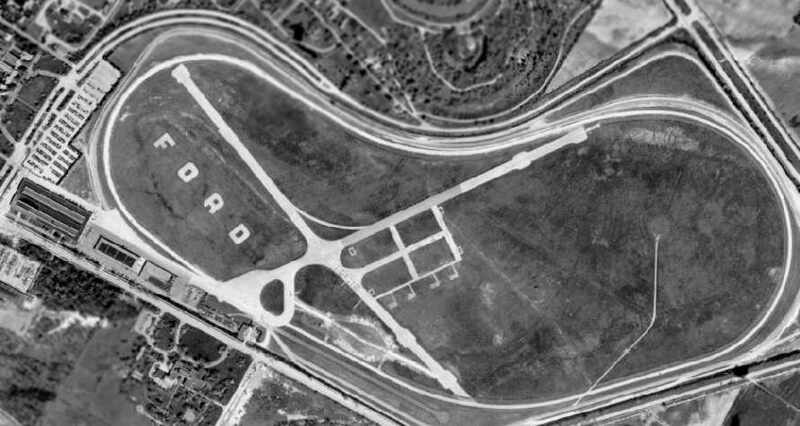 Ford Airport was shown only 2 years after it was closed, in a 1949 aerial photo (courtesy of Mike Denja). and note the lettering “Closed X Airport” which was barely discernible on the middle of the former northwest/southeast runway. A number of paved aircraft parking spots were located just east of the runway intersection. but it appears the mast itself had already been taken down. A circa 1951 photo of a new 1951 Ford convertible climbing the carburetor grade at the Dearborn Proving Grounds, as it was then called. Above & behind the car in the photo are the old Ford Airport passenger terminal & hangars. actually flew into that airport in 1975 or 1976 after North Central Airlines donated the aircraft. I recall it made a low pass, then fired the JATO bottles attached to it. I was a TV reporter for WJBK-TV at the time and covered that story. A 6/9/03 photo of a 1929 Ford Tri-Motor which landed at Ford Airport for the Ford 100 Year Anniversary Celebration (courtesy of Greg Steinmayer). Five vintage airplanes (including 2 Ford Tri-Motors) landed at the former Ford Airport. It was the first time in 56 years the test track had been used as an airport. 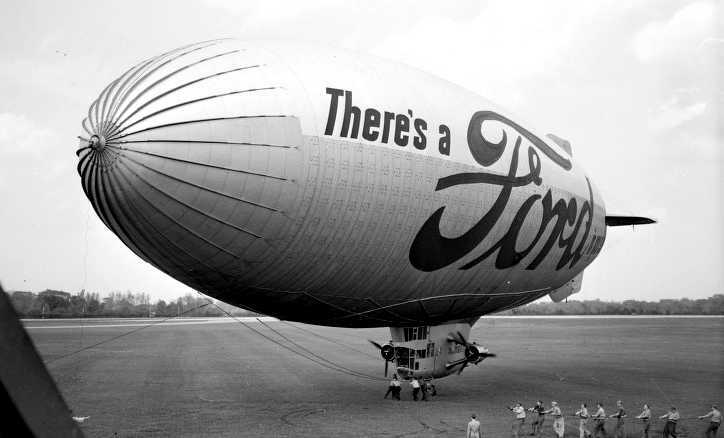 which was one facet of Ford Motor Company's 100th anniversary celebration. 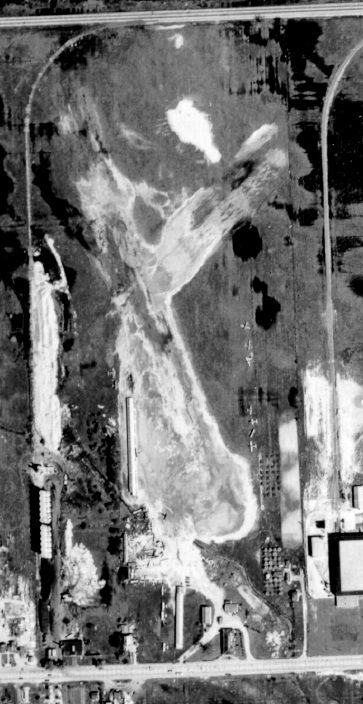 A 2004 aerial photo showed the remains of 2 paved runways of the former Ford Airport were still discernible in the middle of the auto proving grounds. Along the south end of the former airfield, the building farthest to the left is a Ford Engineering facility that was built in part of the old Ford Airplane Factory. Looking at it today you could never tell what it was in a former life. Moving to the right, the next small building is all that remains of the powerhouse for the former Ford Airplane Factory. Today this building houses garages for prepping cars for the test track. where the first Ford Tri-motors were first assembled while the big factory was still being built. The hangar was later used to house the Ford Tri-Motor airplanes. It still exists today but houses a small wind tunnel for experimental vehicles. To the south of this hangar is the Dearborn Inn. The 4th building moving to the right was built back in the 1970s & is another testing facility. 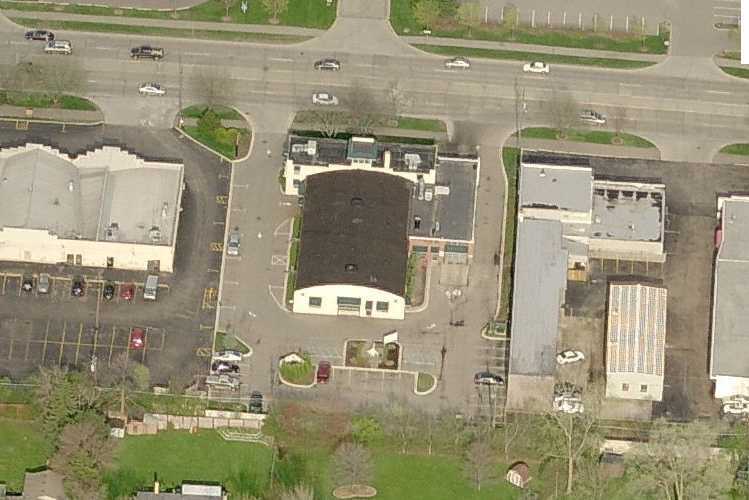 Located north of the 3rd & 4th buildings is a small structure that has been heavily added onto - the former Ford Airport passenger terminal. Just beyond that is a concrete circle where the dirigible mast used to be. complete right down to their huge glass sliding doors (now painted over). The building is now used for 'Experimental Engines' by the Ford Motor Company." still exist on the Southwest side of the former airfield (along Oakwood Boulevard). They are currently used as testing labs. Directly across from the hangars is the Dearborn Inn, constructed as the worlds first specific airport hotel. It is still in operation as the premier hotel in Dearborn." 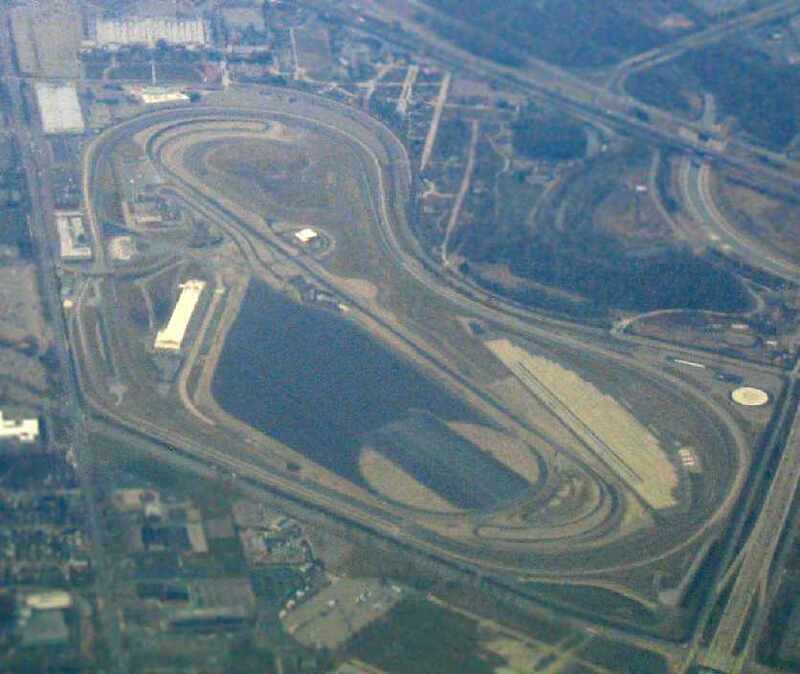 Greg Steinmayer reported in 2005, “Ford Airport, which became the Ford Proving Grounds, is no more. which were still extant as part of the proving ground's roadway system. A March 2006 aerial view by Paul Freeman, looking northwest at the site of the former Ford Airport. A March 2006 aerial view by Paul Freeman, looking southeast at the site of the former Ford Airport. and it began by demolishing what was Wind Tunnel Lab # 1 which had originally been the Ford Airport Terminal, the first airport passenger terminal in the country. 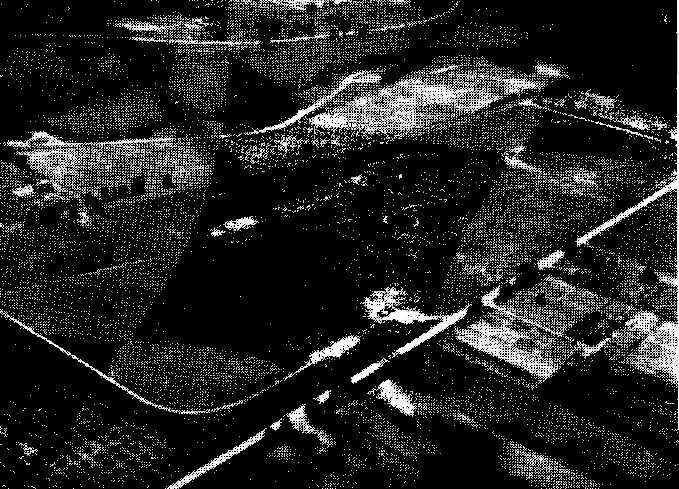 A 2017 aerial photo of the Ford Proving Grounds showed almost no recognizble trace of the former Ford Airport. 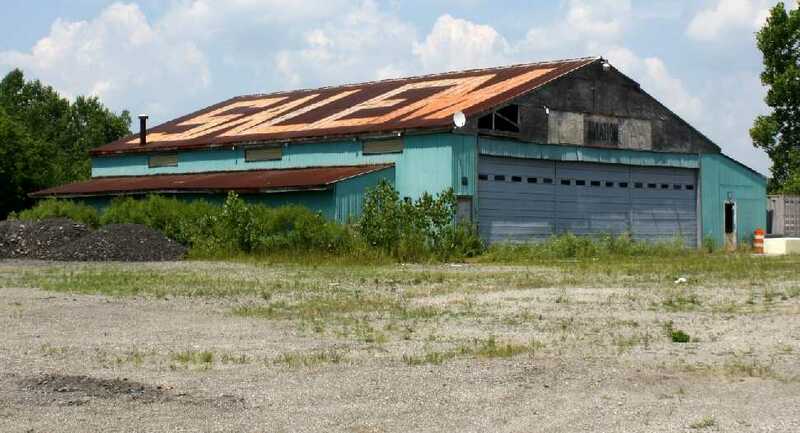 According to a Ford document, “On 3/5/18 demolition will commence at the Experimental Engine Building”, which is evidently the last remaining hangar. Thus eliminating the last vestige of Ford Airport. 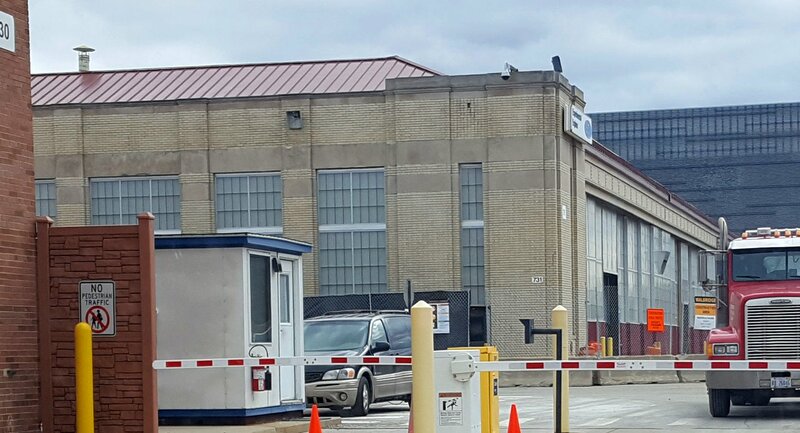 A 3/10/18 photo by Greg Steinmayer of the Ford Experimental Engine Building, the last remaining Ford Airport hangar. A 3/10/18 photo by Greg Steinmayer of the demolition of the Ford Experimental Engine Building, the last remaining Ford Airport hangar. Greg reported on 3/15/18, “As of yesterday, only a small portion of the main hangar of the Ford Airport remains, and by tomorrow it will all be gone. Greg Steinmayer reported in 2018, “The Ford Airport lives on - in a small way. The Ford Airport site is located north of the intersection of Oakwood Boulevard & Rotunda Drive. The Henry Ford Museum is adjacent to the airport site. Another airfield which is currently operated as a Ford proving ground is Yucca AAF, AZ.